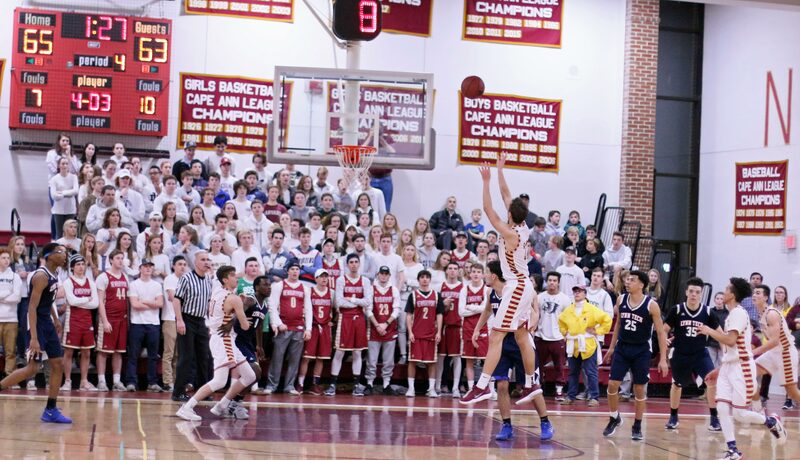 (Newburyport MA) I had to check my calendar when I arrived at this game. 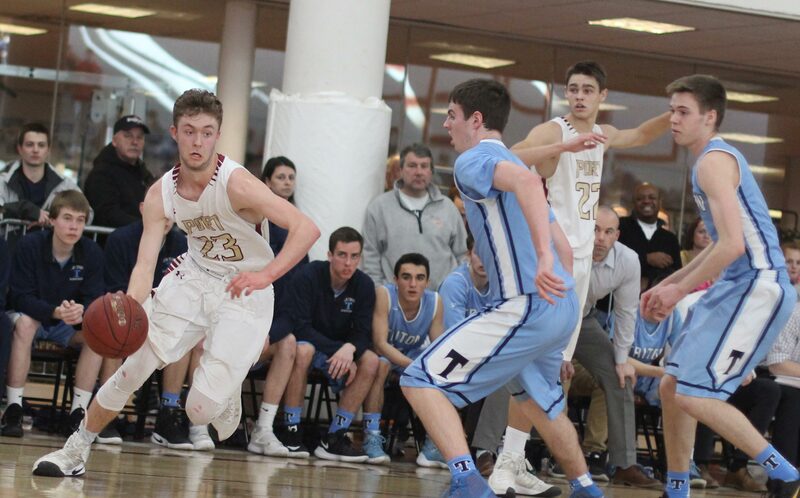 It wasn’t March but there was definitely a tournament buzz in the room. 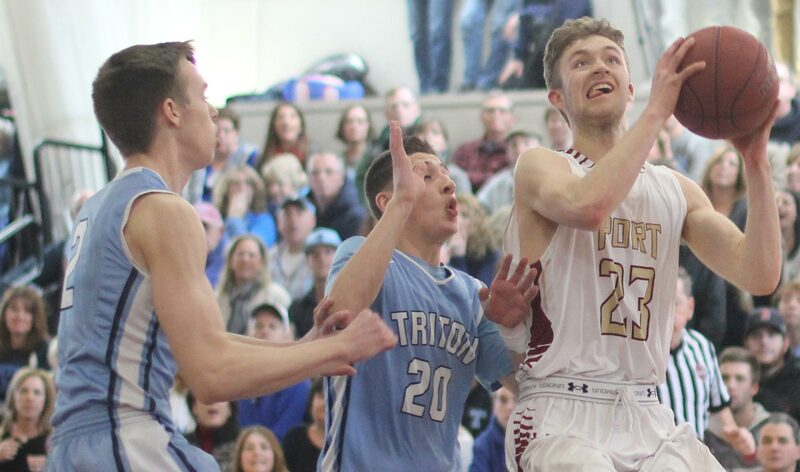 However, it doesn’t need to be March when it’s a Triton/Newburyport game. 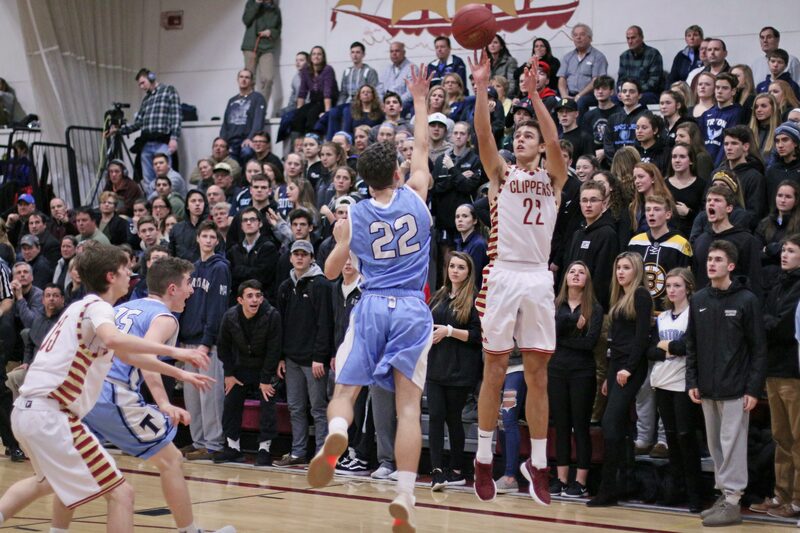 Last March the two teams had a down-to-the-last-shot Division 3 North quarterfinals get-together in the same building. 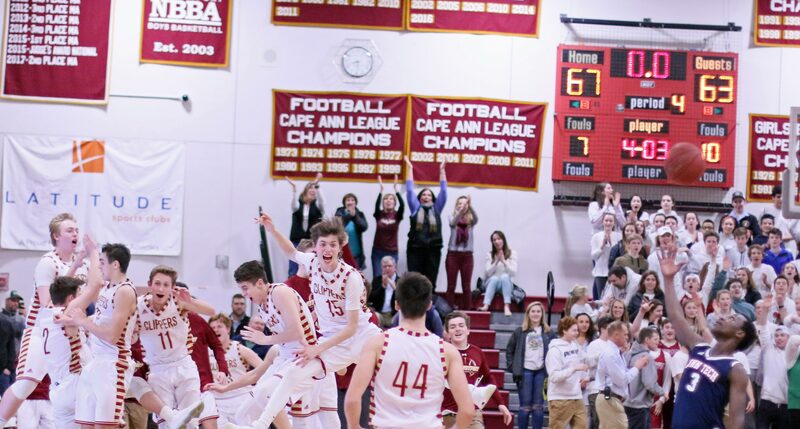 Newburyport won that game. 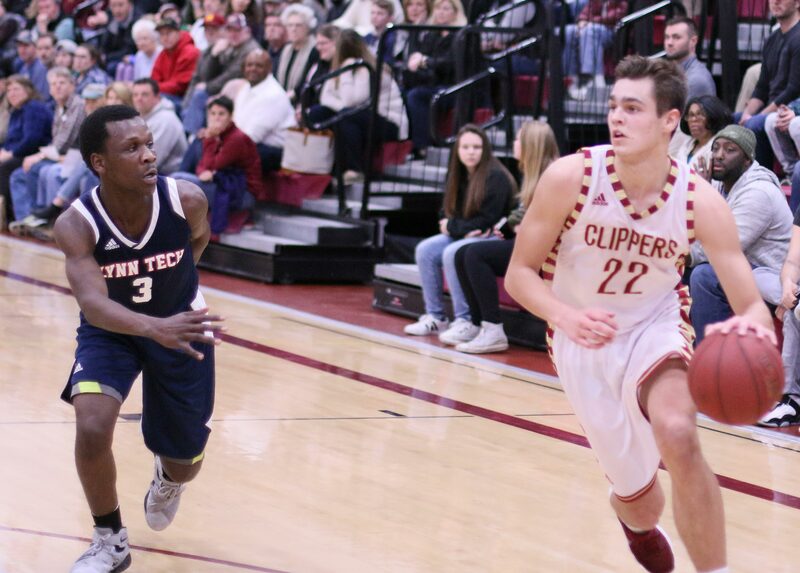 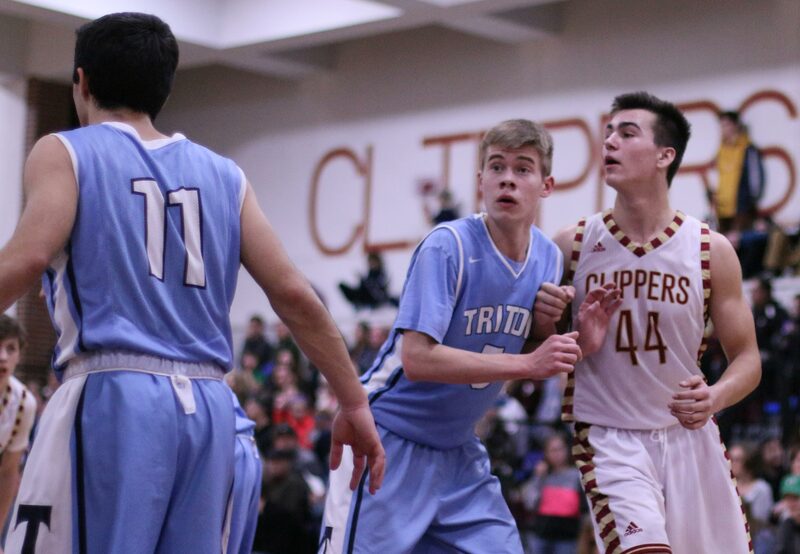 In December of last year, the Clippers defeated Triton, 63-57. 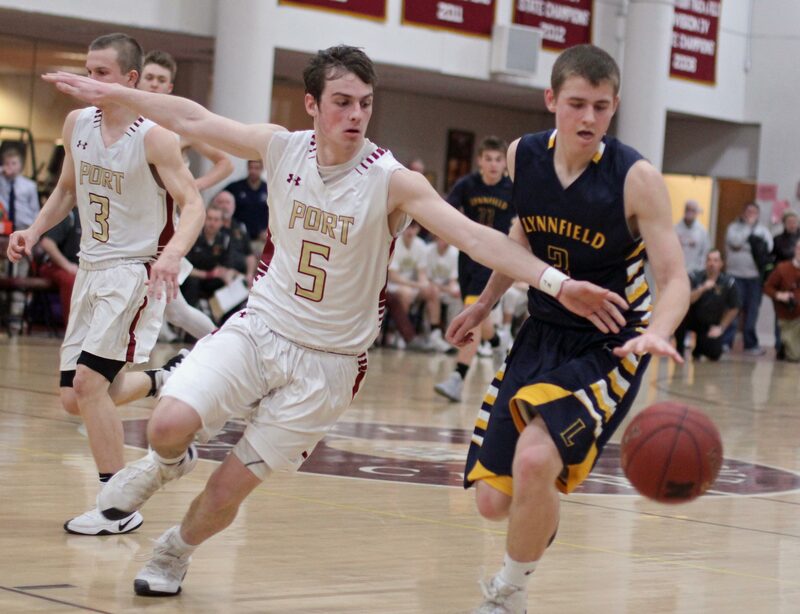 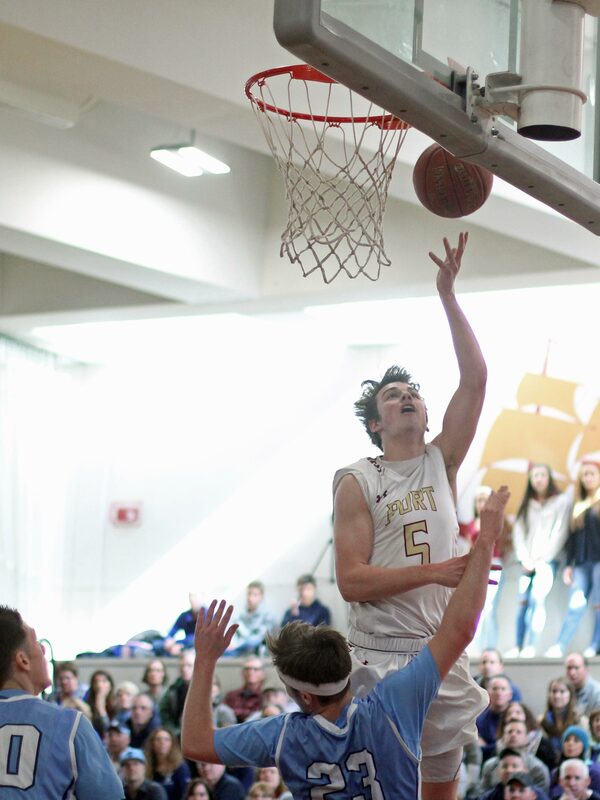 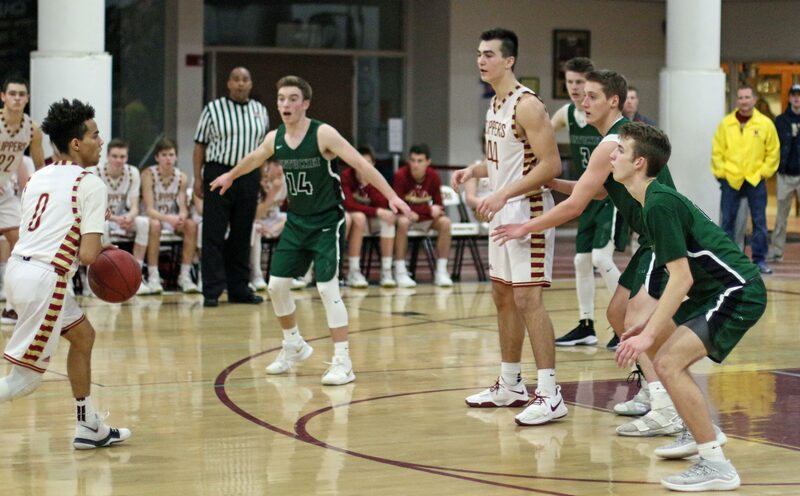 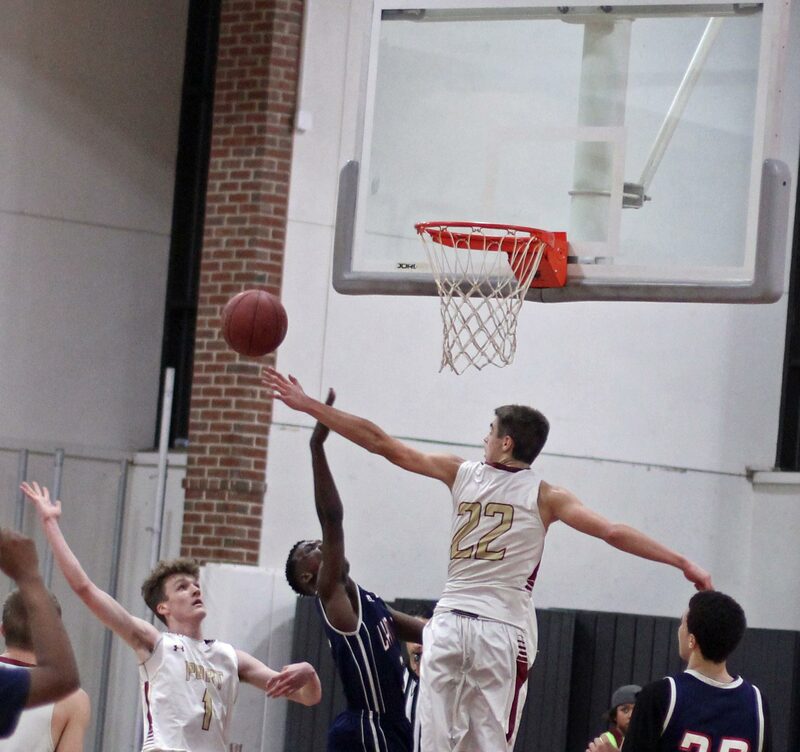 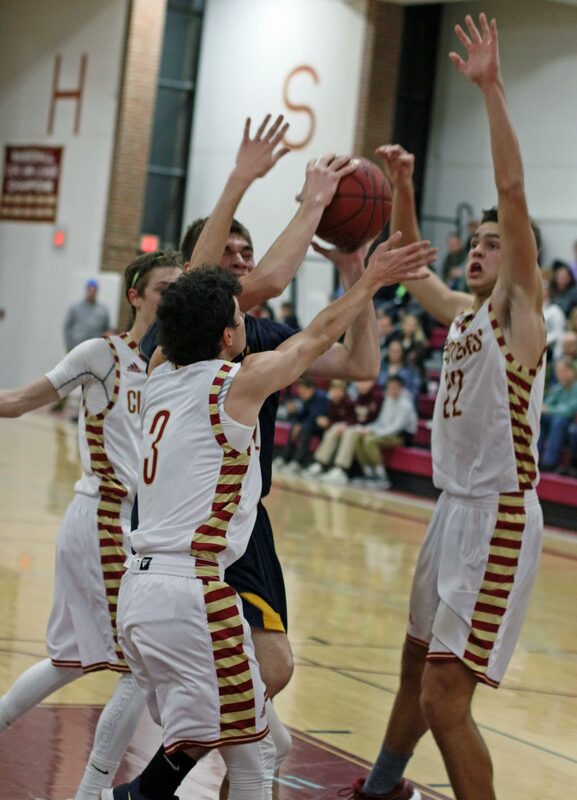 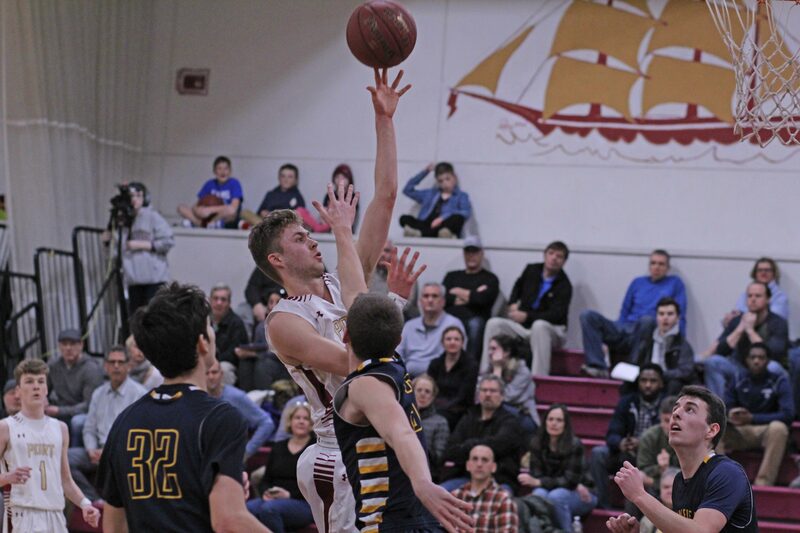 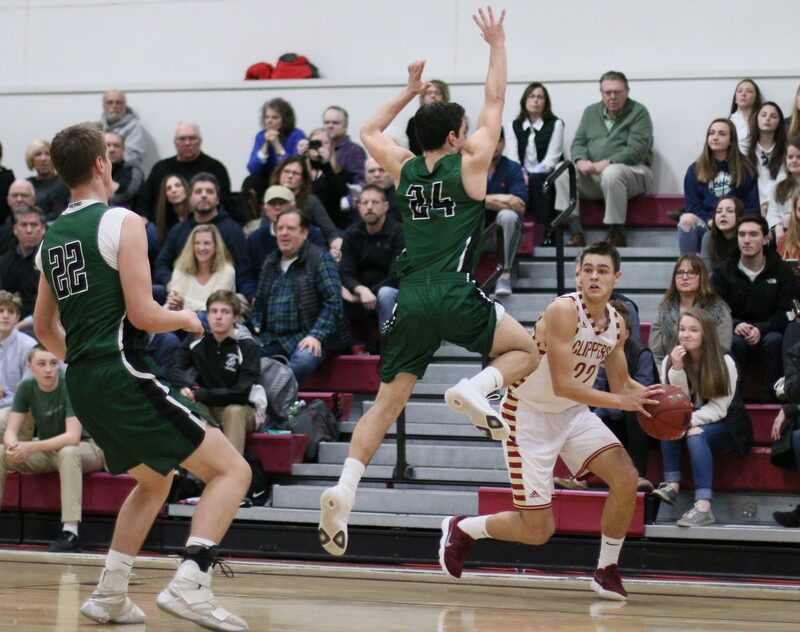 That win streak continued tonight as Newburyport (10-3) prevailed, 57-50, on Friday night in Cape Ann League action. 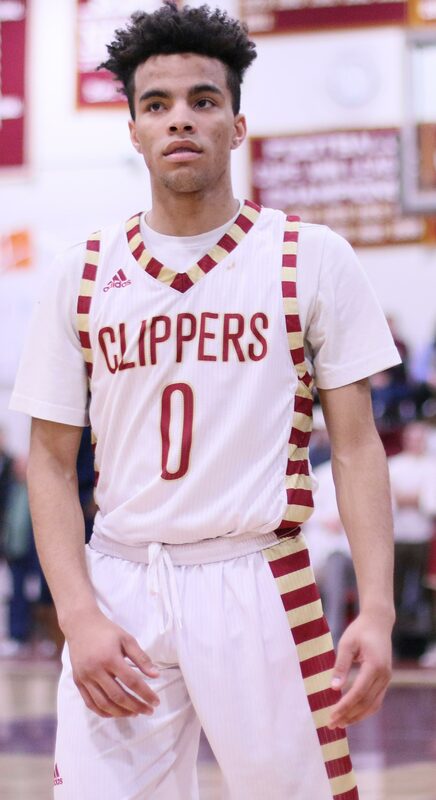 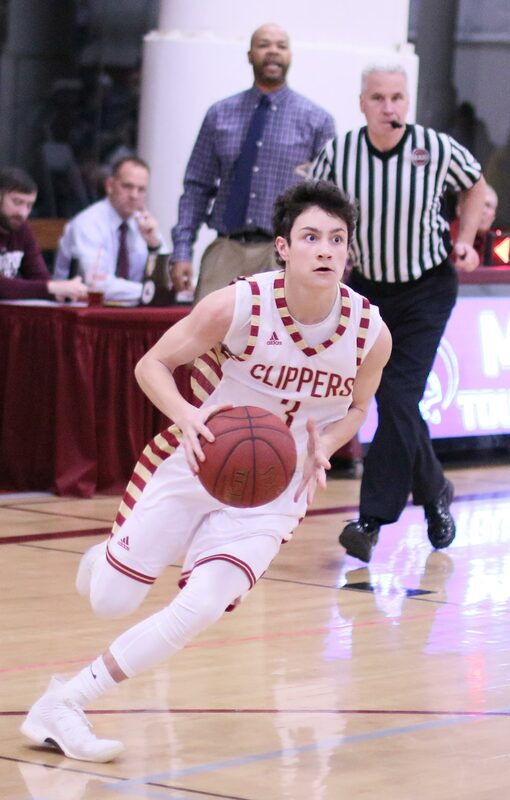 Ryan Archie (nine points) started the scoring with a 3-pointer for NHS and the Clippers never trailed. 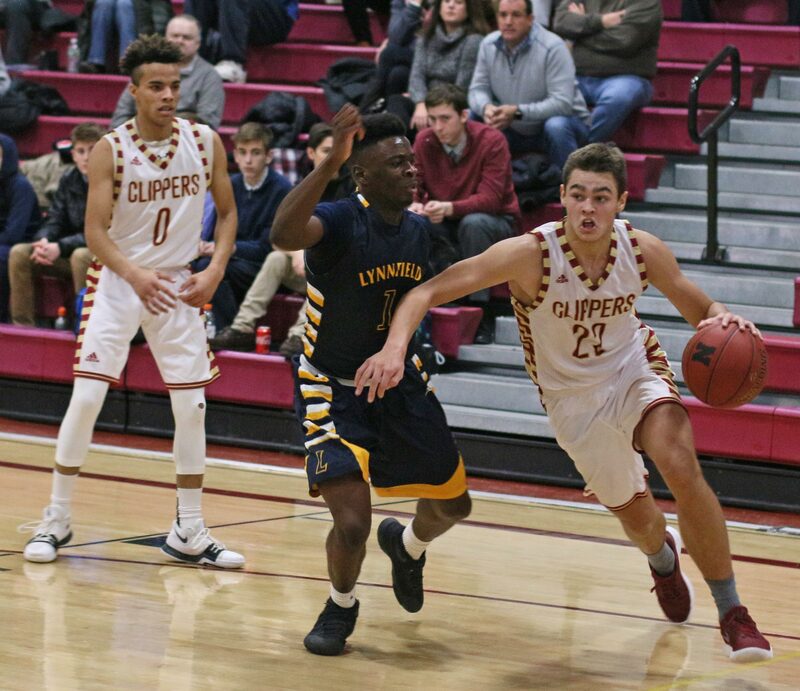 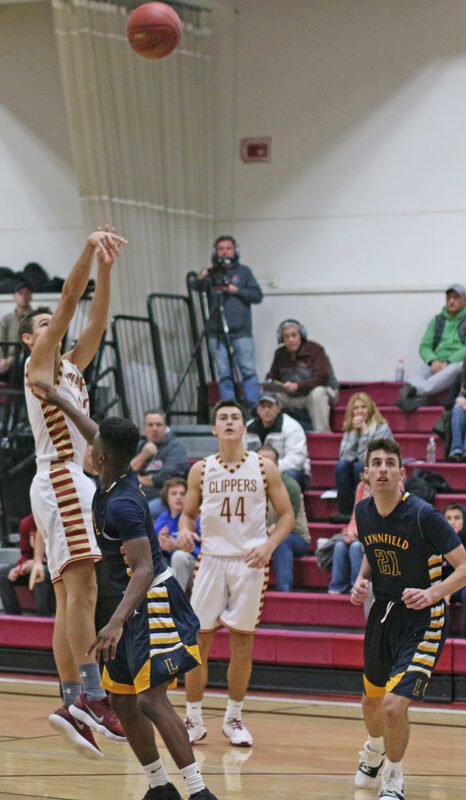 The Vikings (4-8) looked done late in the third quarter when a three by freshman Jacob Robertson boosted the Clippers margin to fourteen points (43-29). 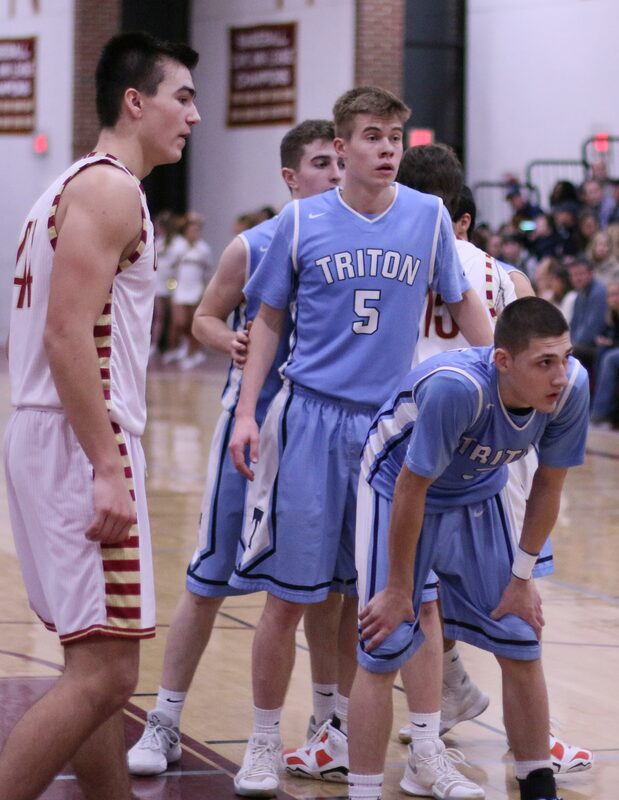 Triton was down but not out. 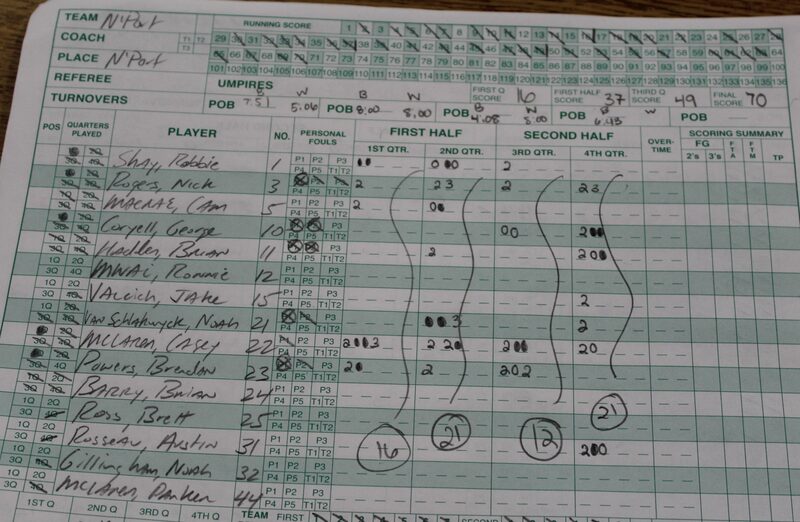 They scored the next ten points and they did it in a hurry. 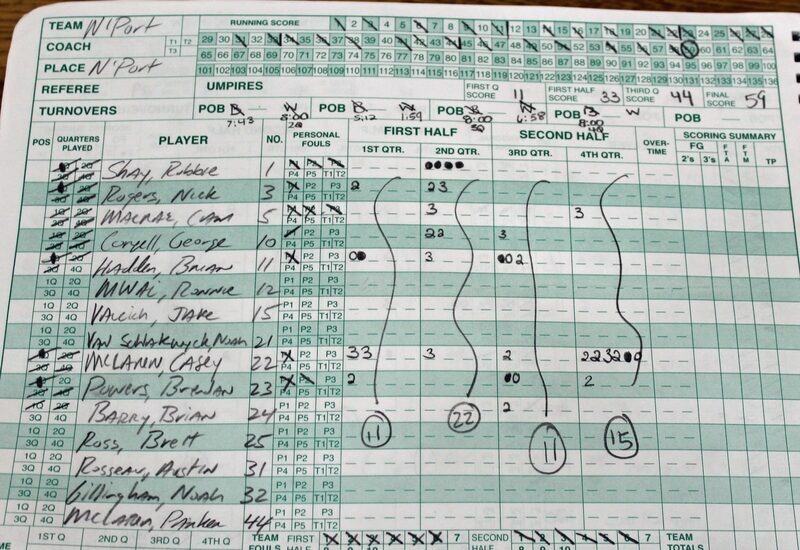 In one minute of playing time, the visitors from Byfield, put that ten-spot together. 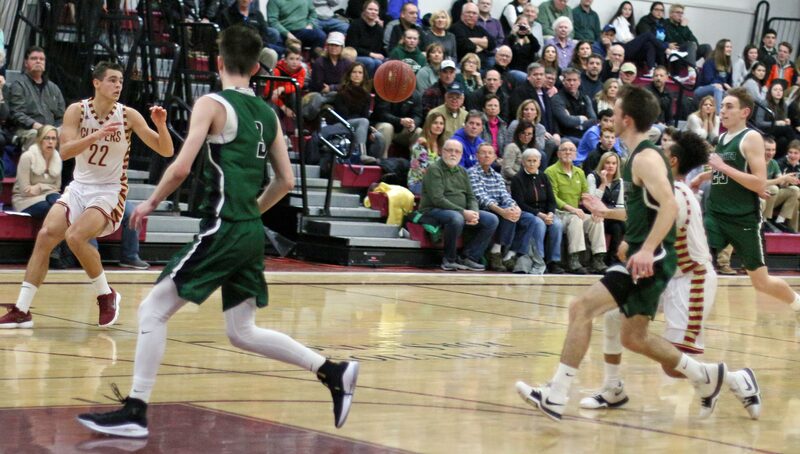 Kyle Odoy ended the 3rd quarter with a layup and then picked off an inbounds pass and put in two more. 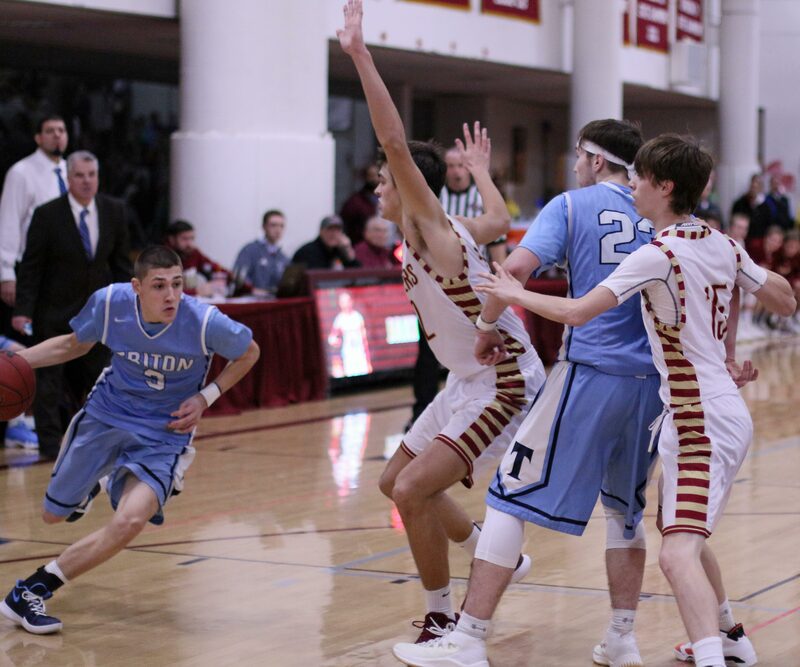 Junior Dylan Shute contributed an old-fashioned 3-point play and then Will Parsons nailed one from beyond the arc. 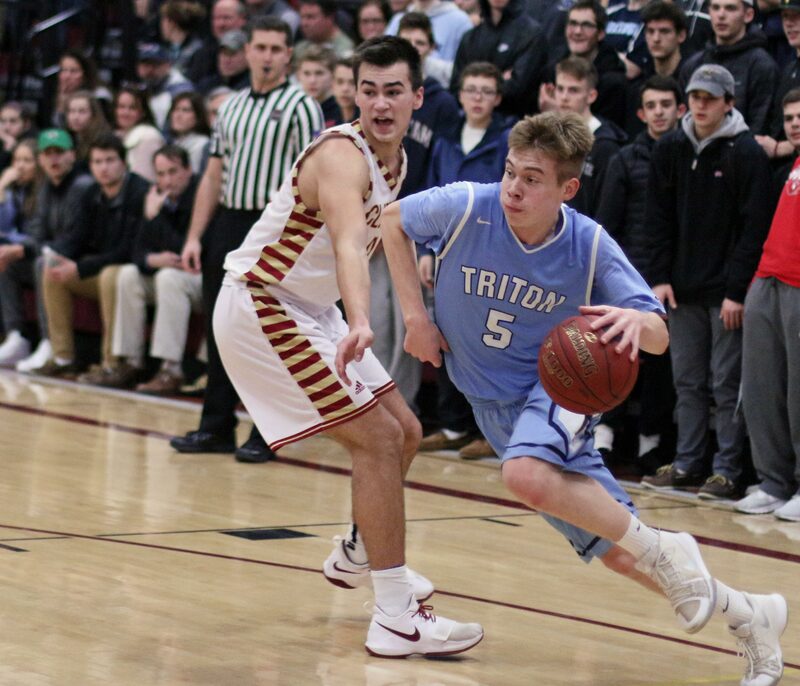 All of that successful offense moved Triton to within four (43-39) with nearly 7 ½ minutes left in the game. 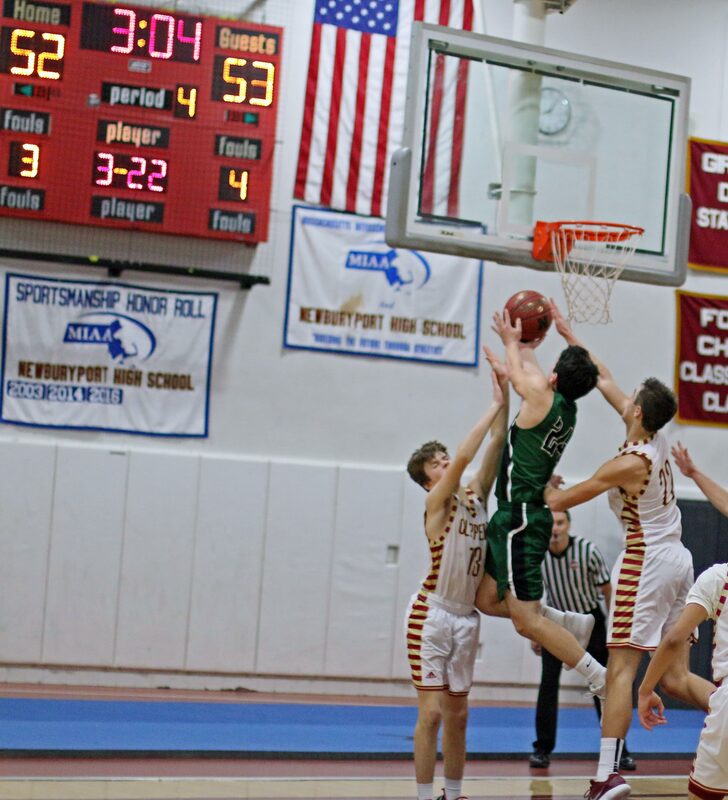 Newburyport, however, had an answer and his name was McLaren. 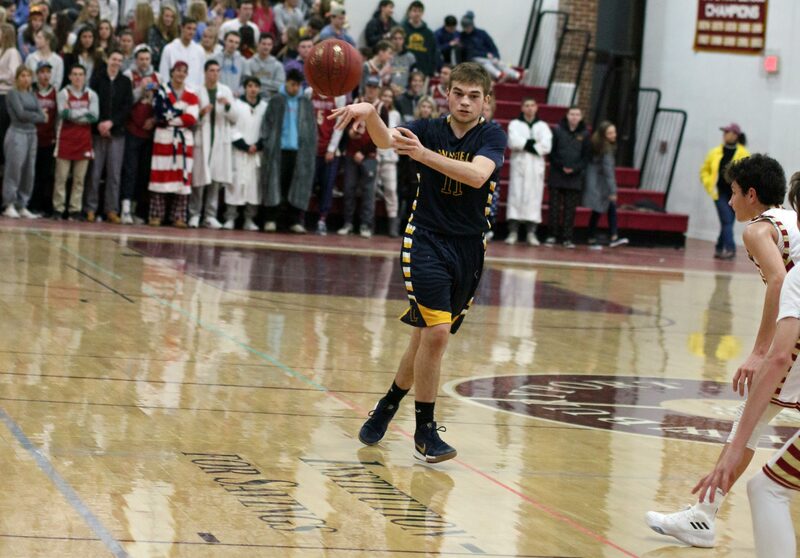 If you weren’t there, you’re thinking Casey. 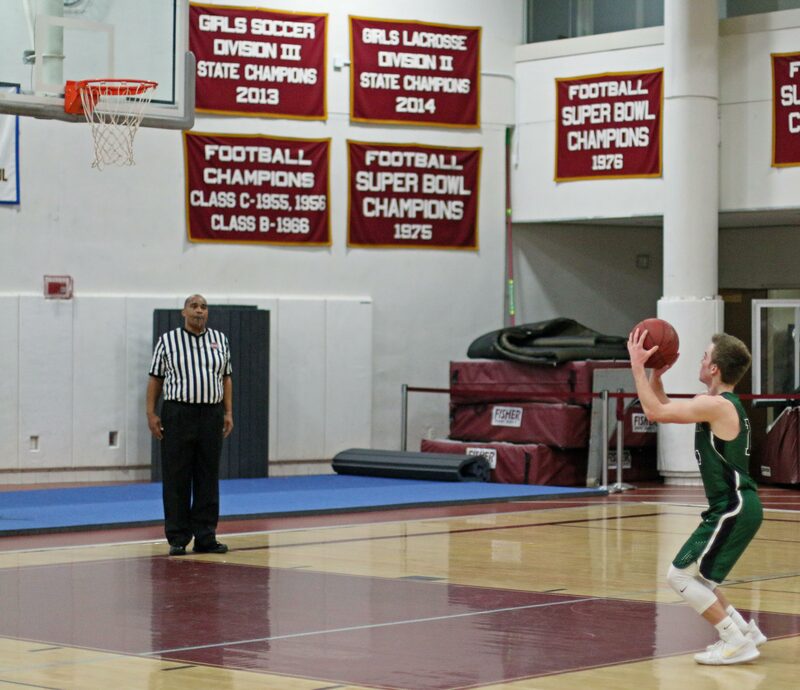 But not on this night. 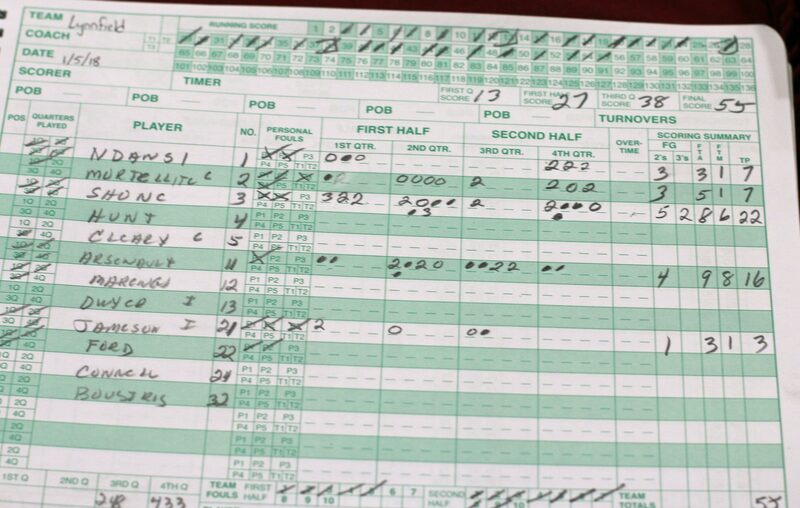 Casey didn’t score a point in the final quarter. 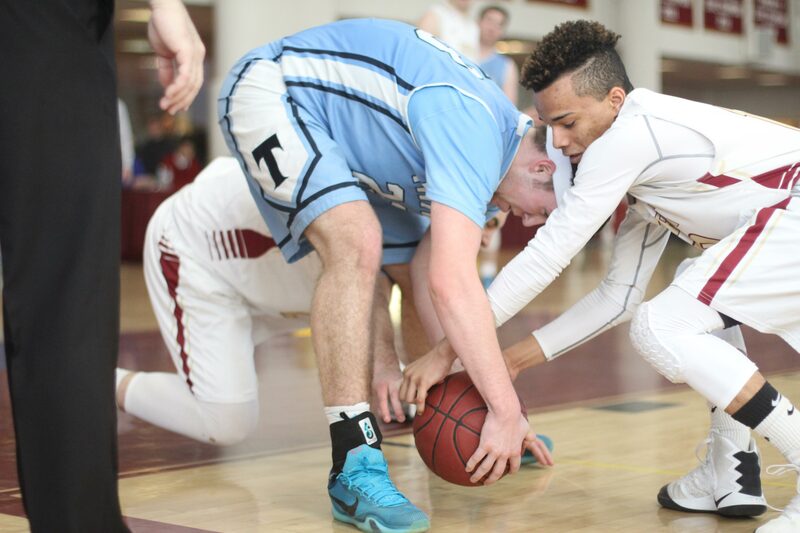 It was Parker doing the heavy lifting. 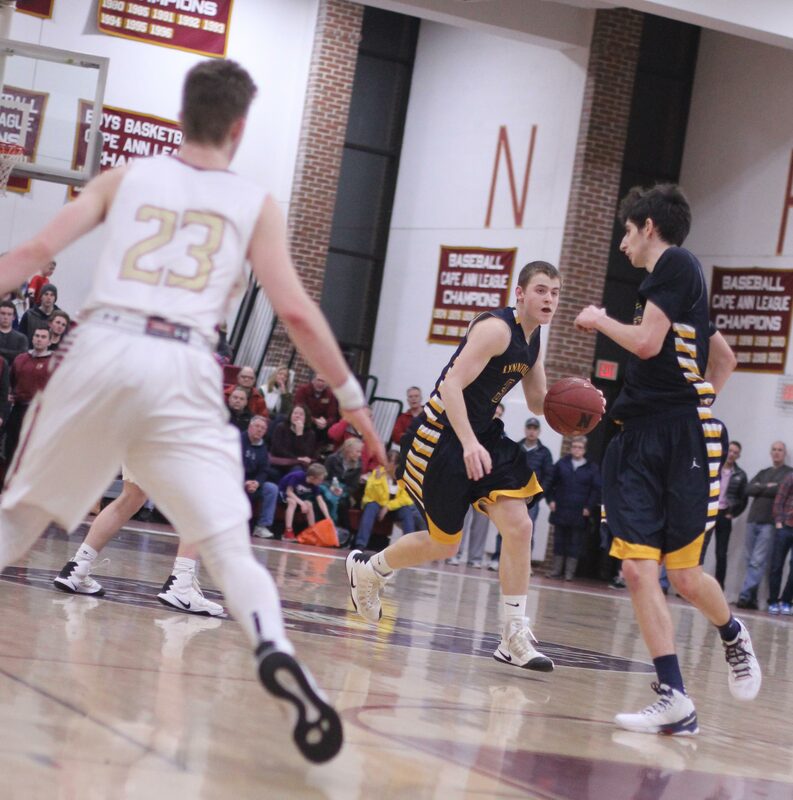 Parker went off for seven straight points while the Vikings had four turnovers. 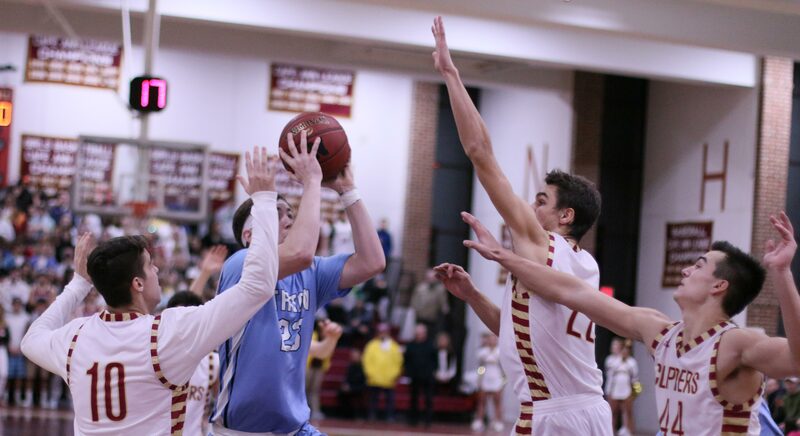 That individual excellence gave NHS an eleven-point lead (50-39) with 5 ½ minutes remaining. 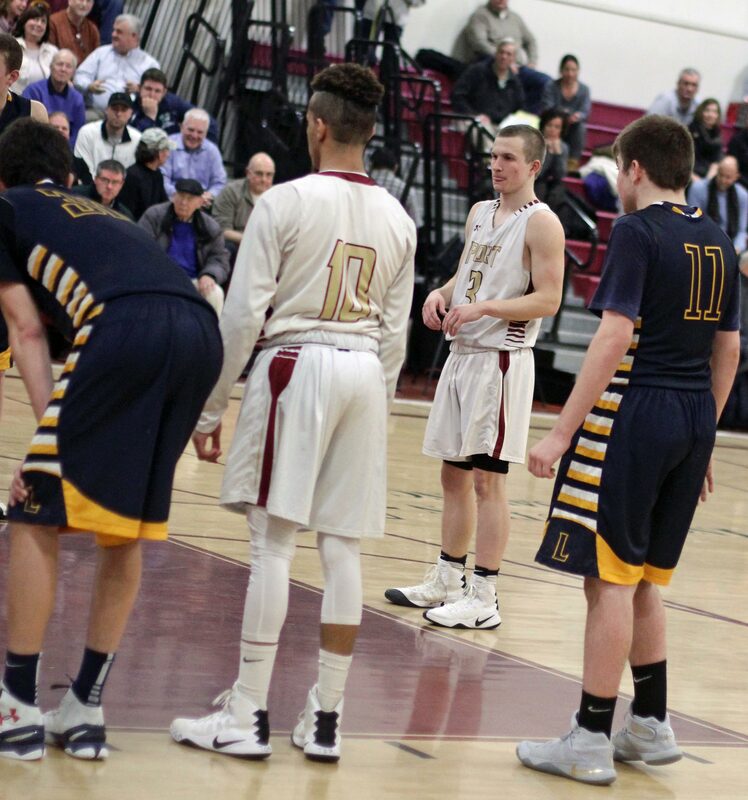 Play out the string? 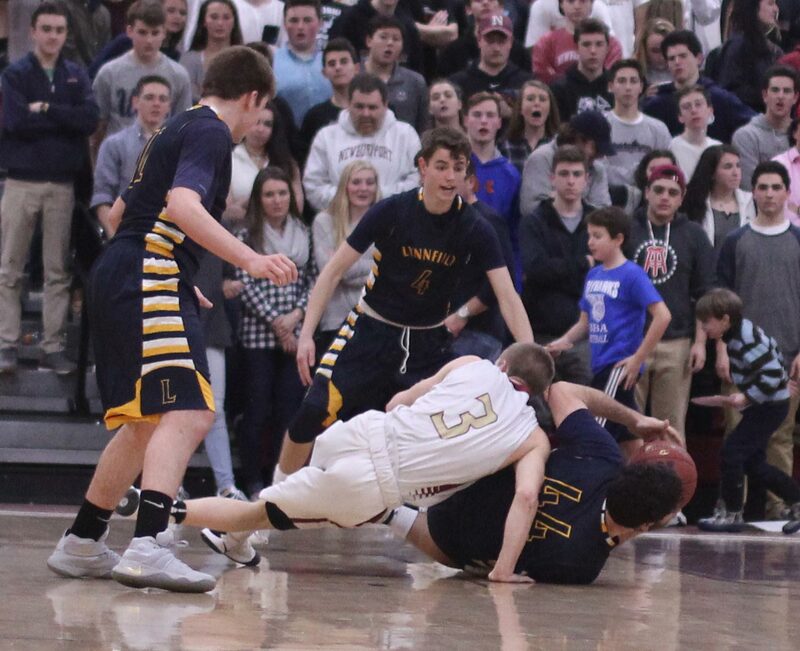 Game over? 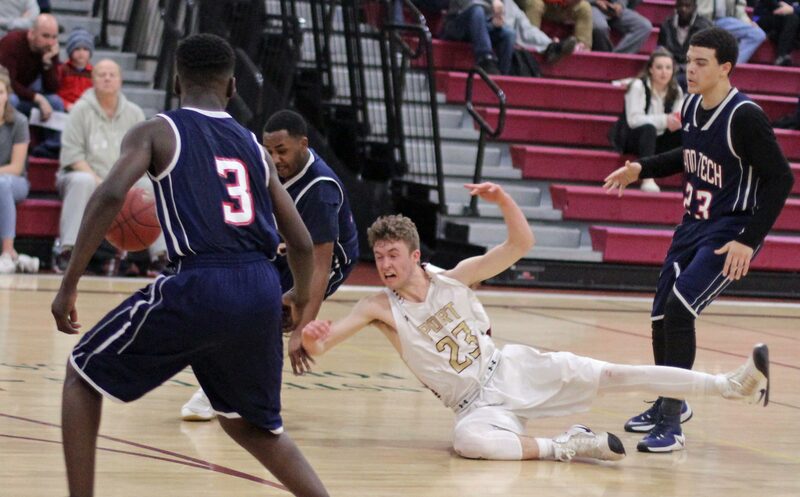 Not yet. 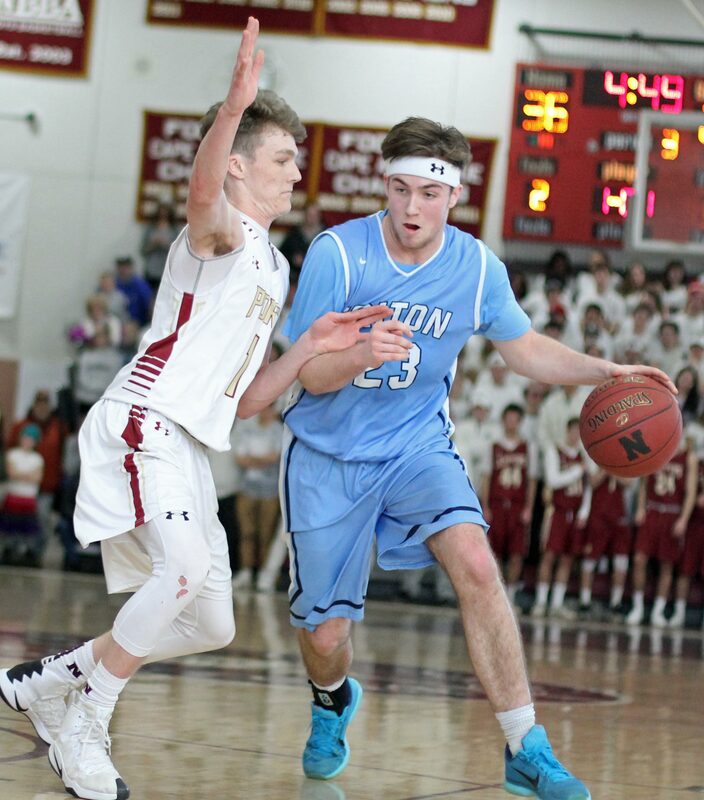 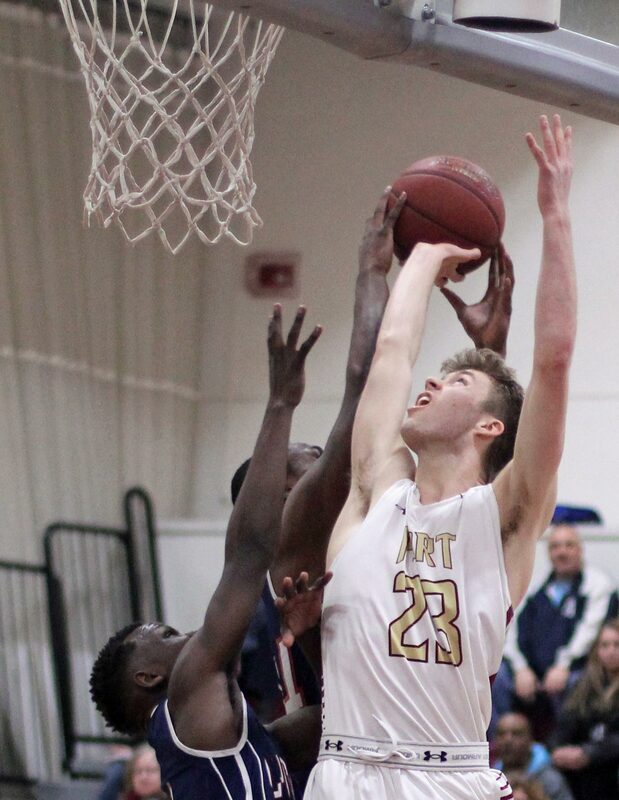 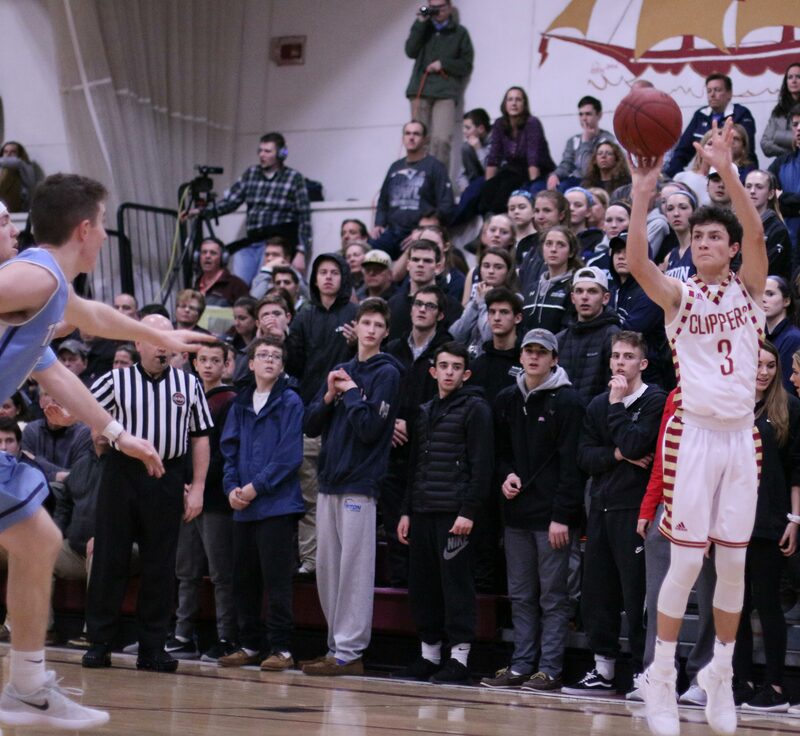 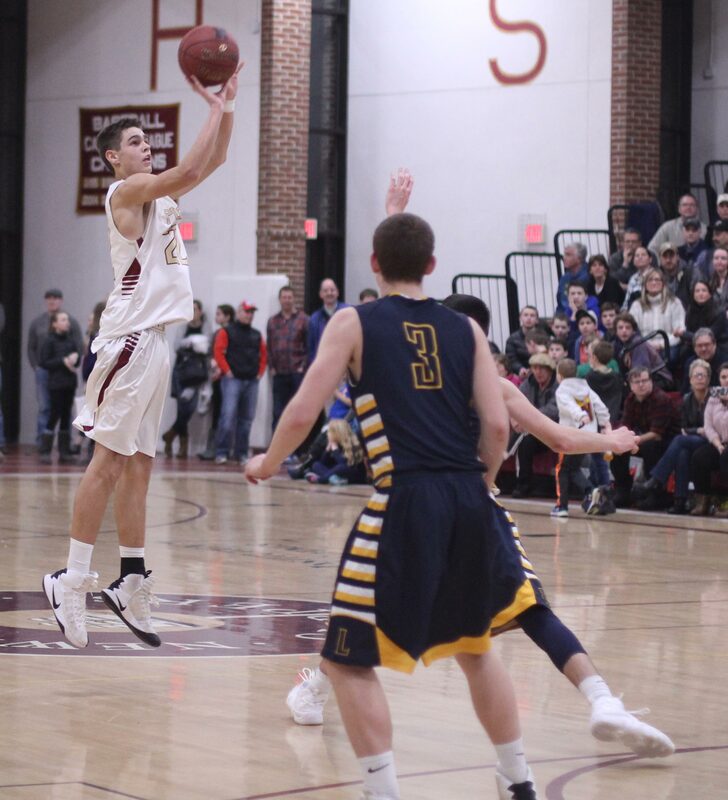 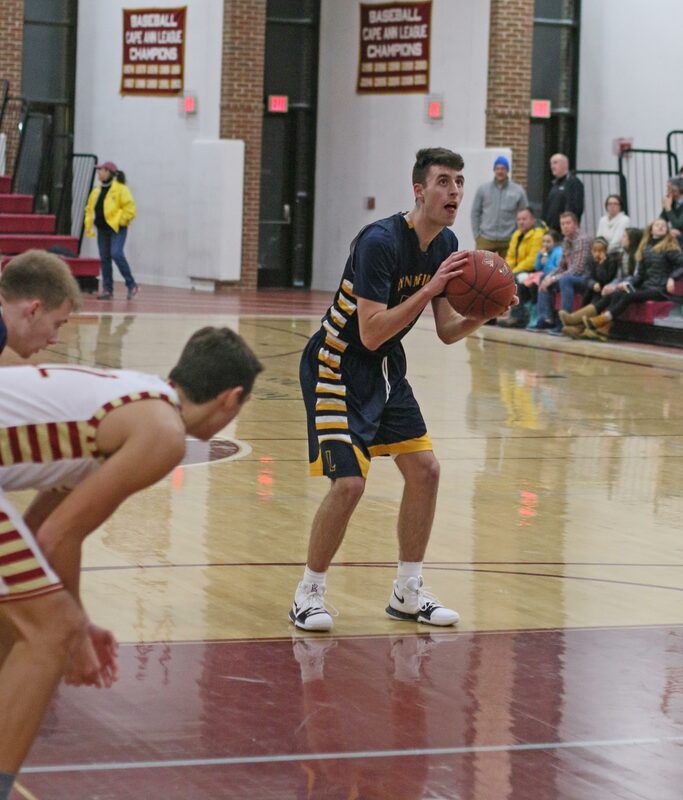 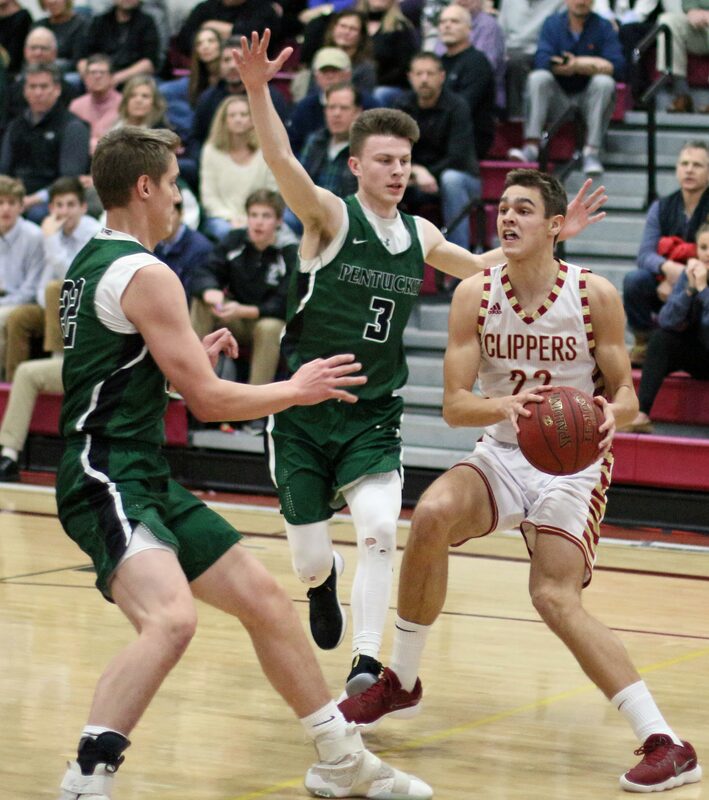 Triton, led by Will Parsons’ seven points and a layup by Jesse Wilkinson, got the Newburyport lead down to four (54-50) with 1 ½ minutes to go. 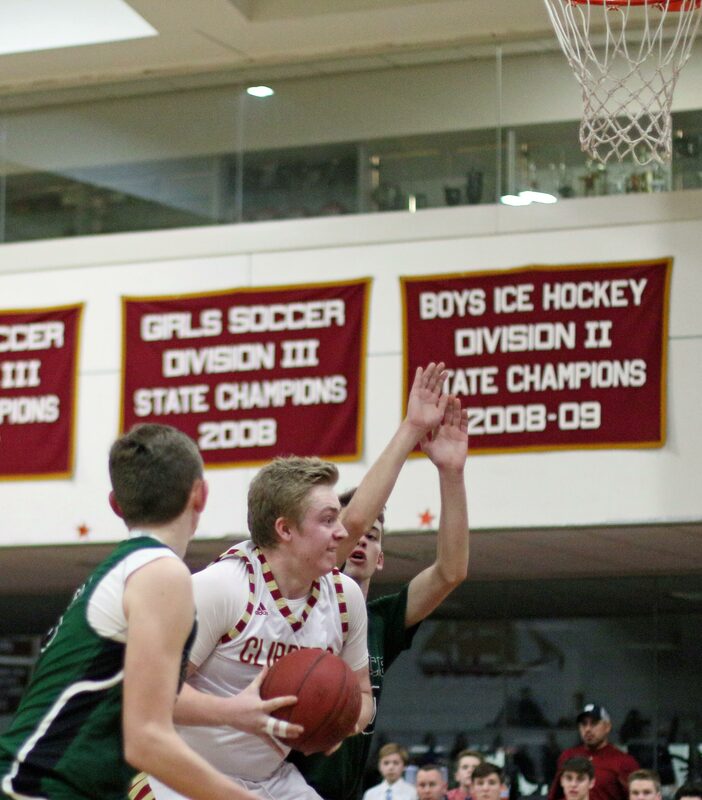 That missed chance put the ball back in Newburyport’s possession. 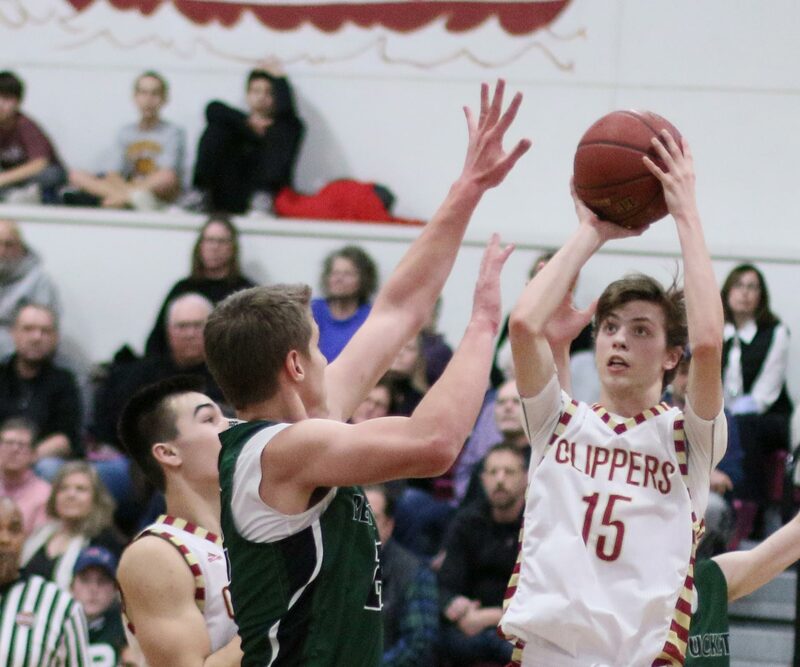 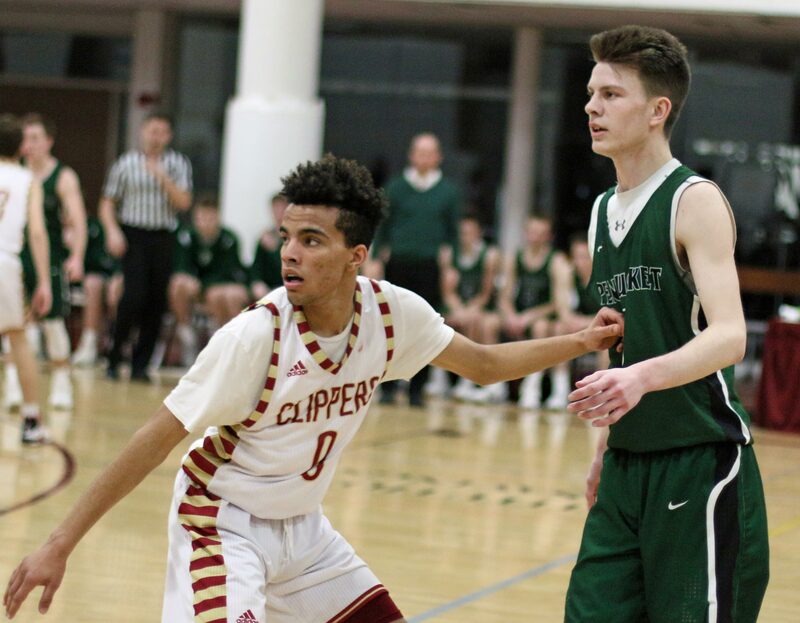 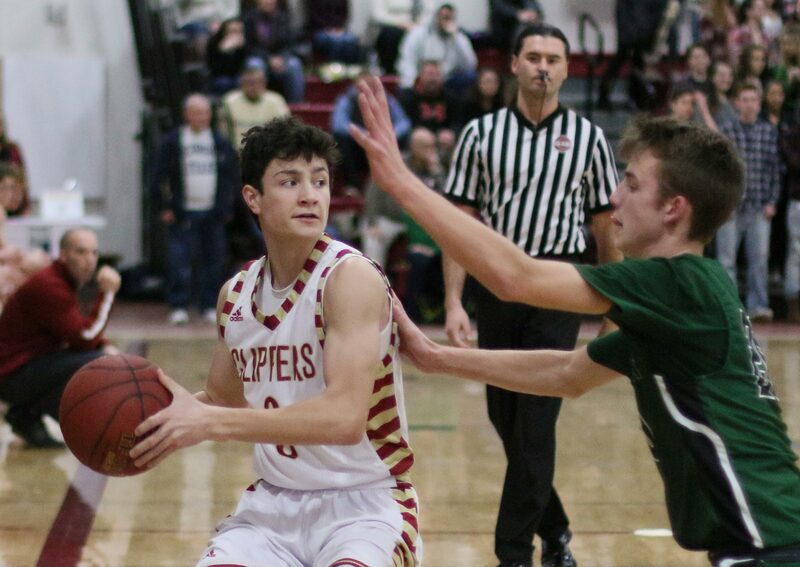 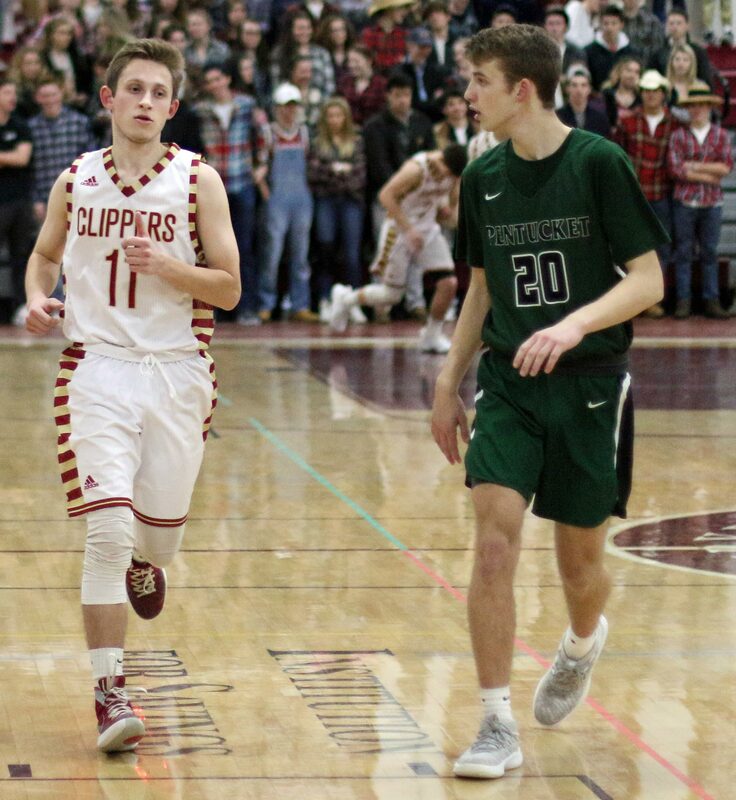 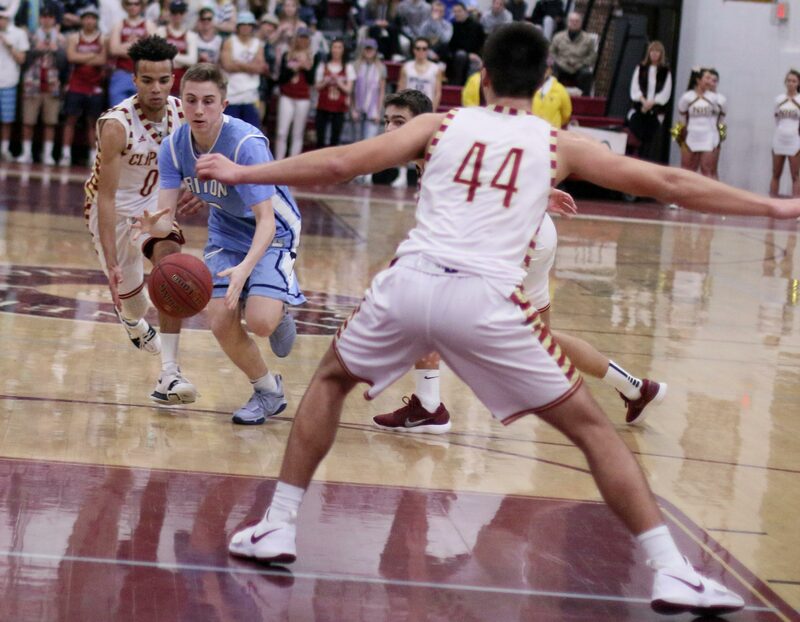 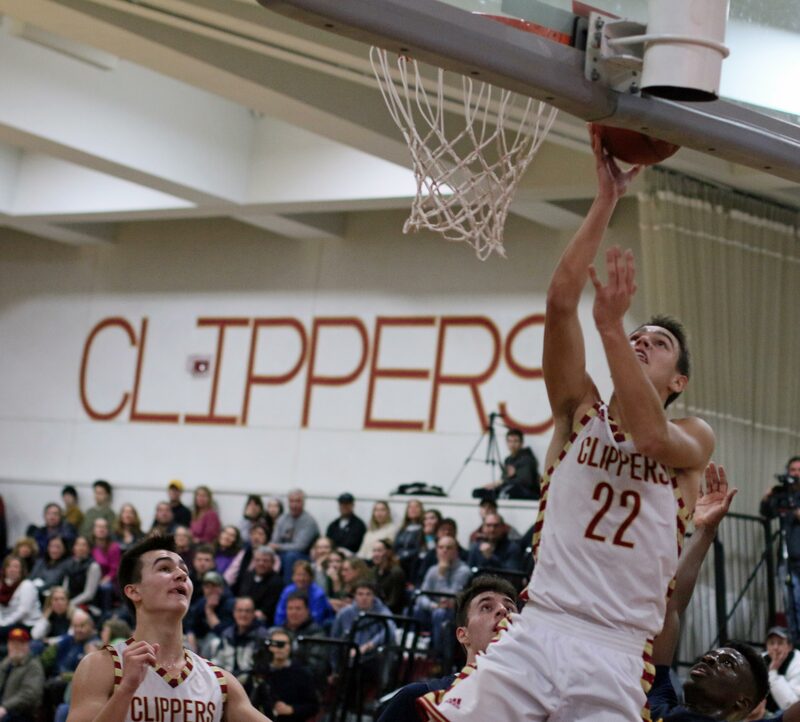 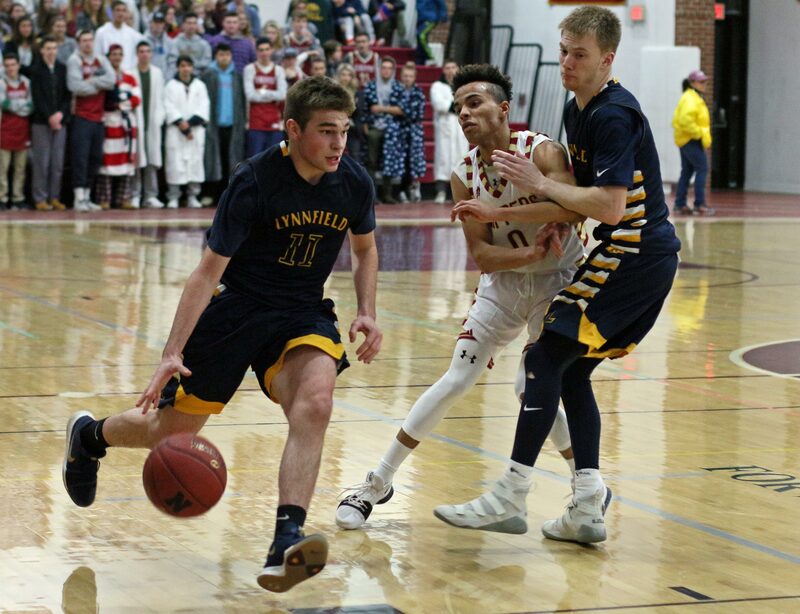 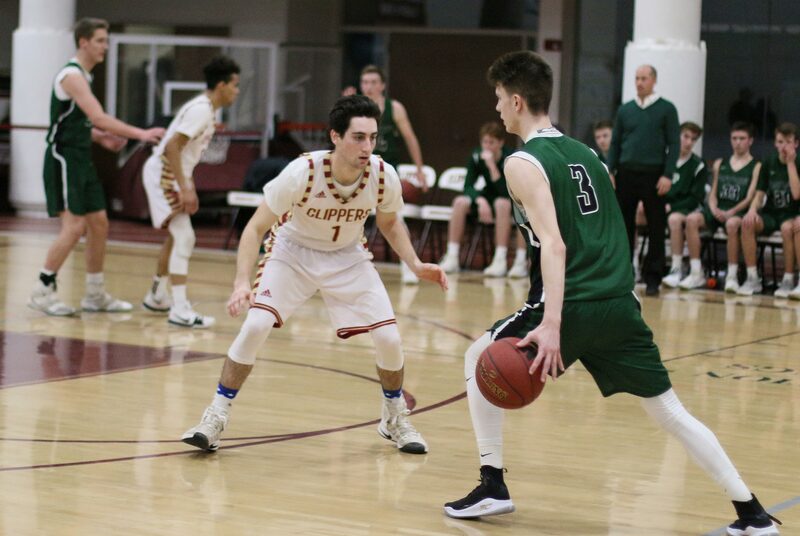 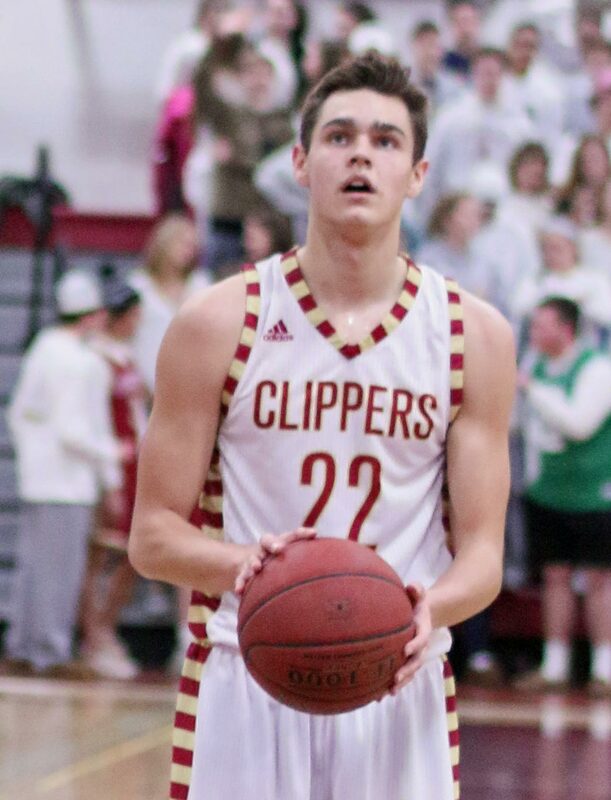 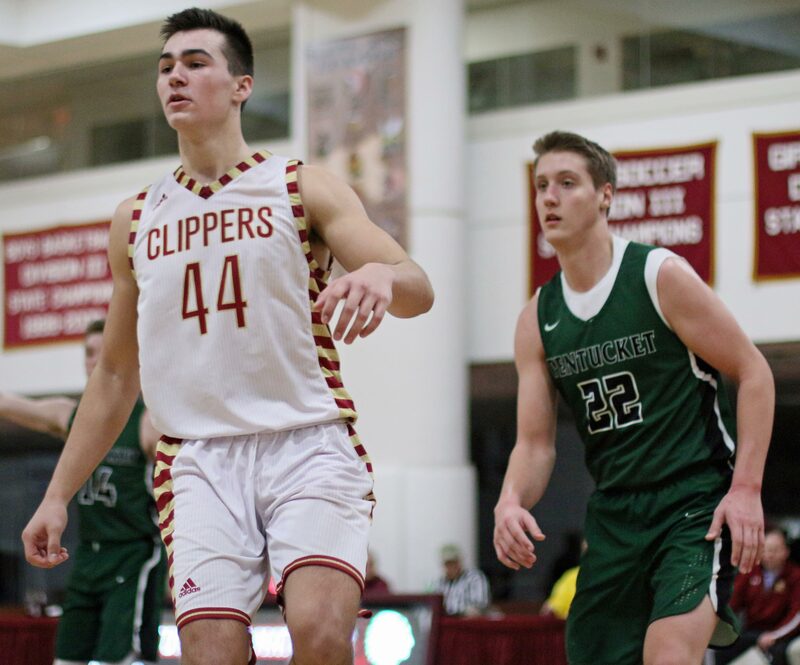 A deflected shot ended up in the hands of Parker McLaren and he converted the rebound into points (his 11th of the quarter) and the Clippers won their tenth and qualified for the state tournament. 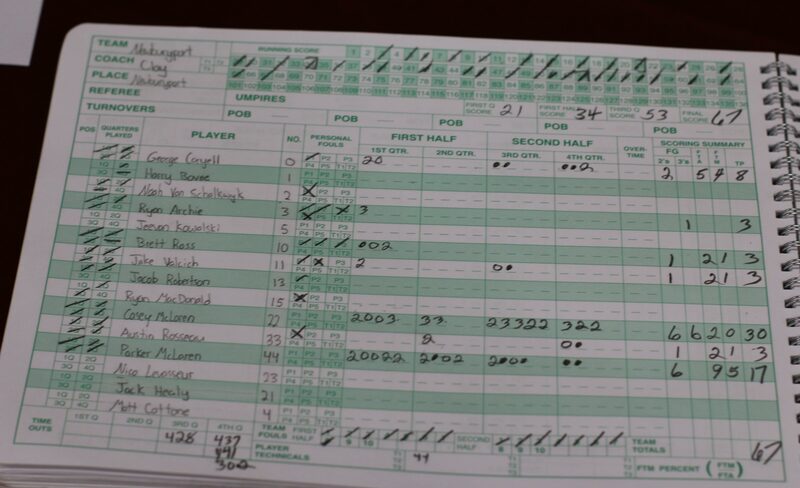 Will ended up with seventeen points, but his only open shots were in warmups. 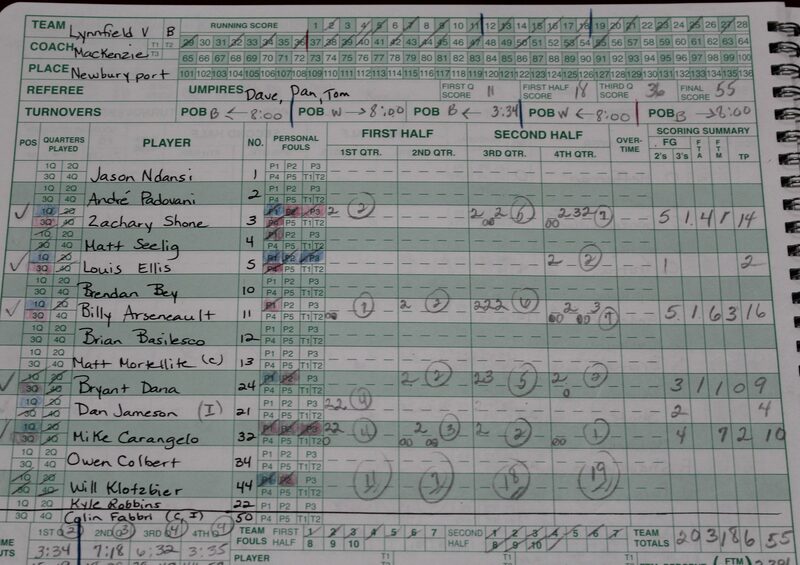 Casey McLaren finished with sixteen points. 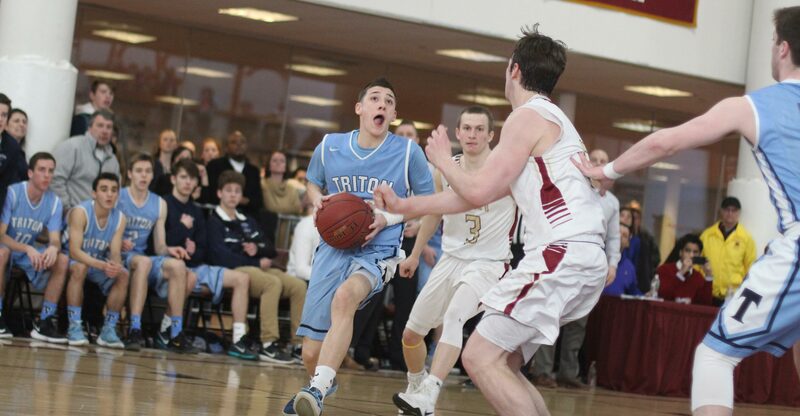 He had four 3’s including several from in front of the Triton student section. 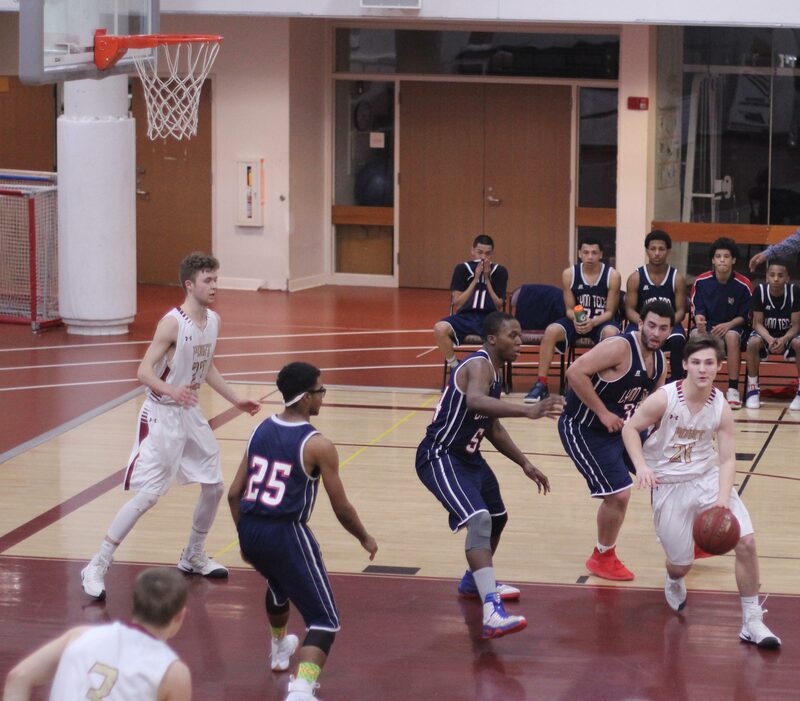 Will (averaging 24.8 points per game) not only faced one defender but plenty of support defense was nearby. 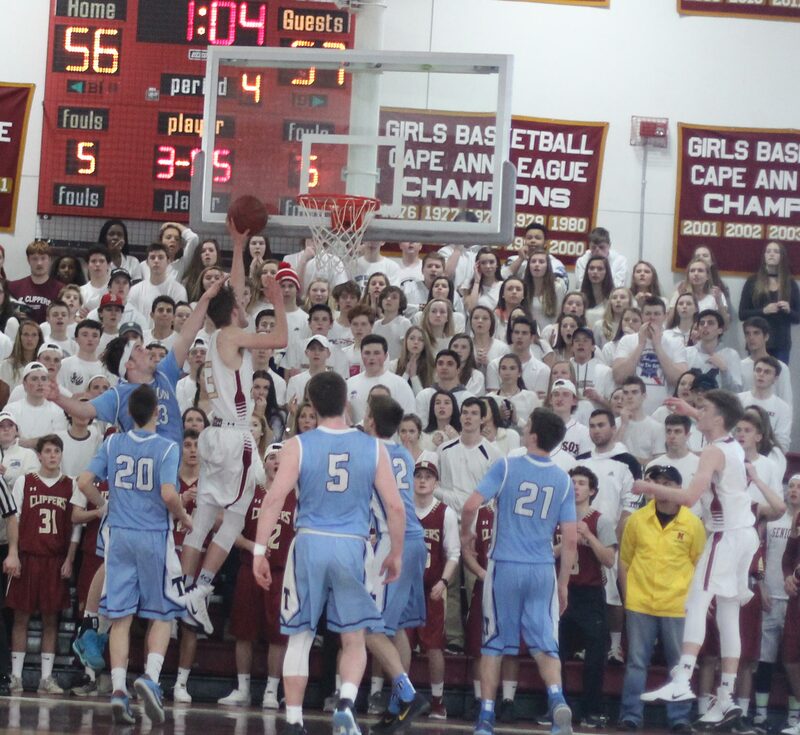 The crowd was remarkable. 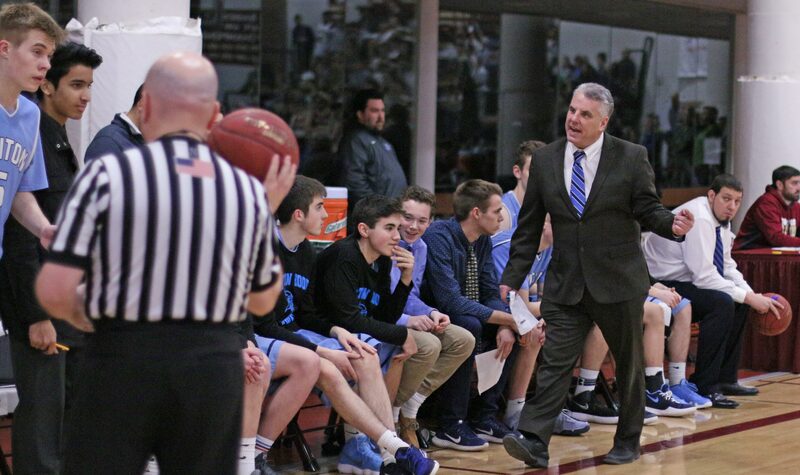 “It was a great environment,” said Coach Clay. 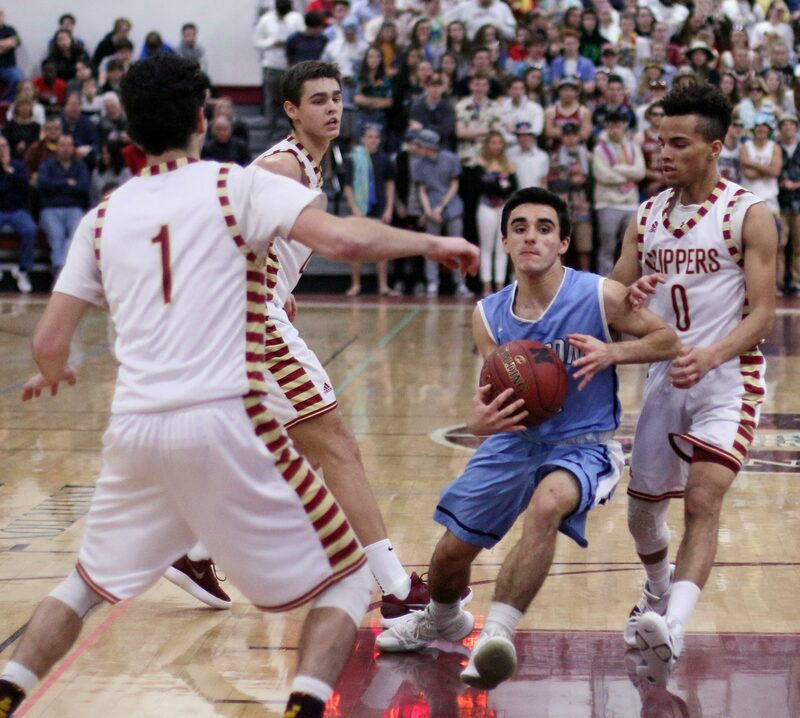 Excellent crowd control in place to make sure no one from either side spoiled it for others. 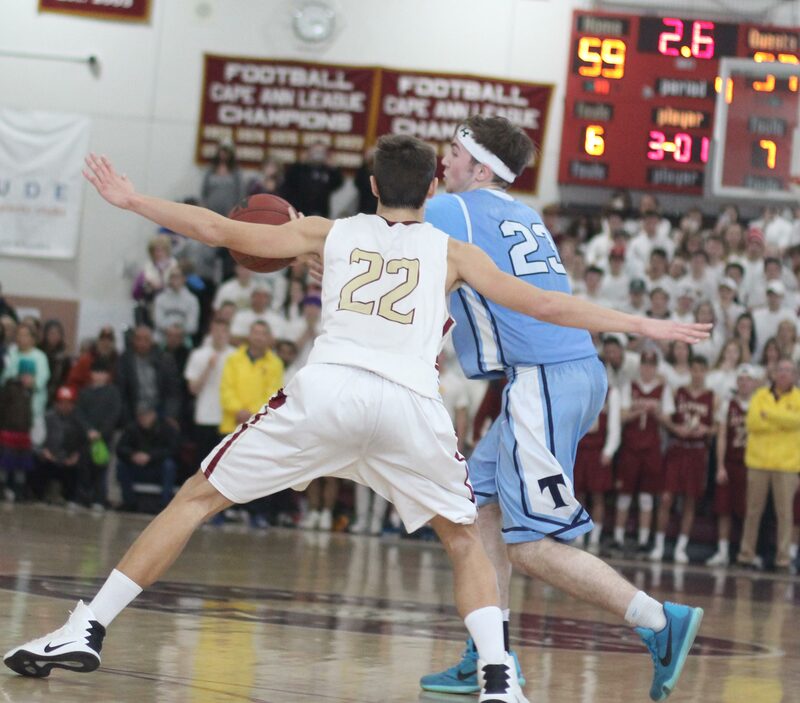 On one occasion, the Triton student section chanted something, and one NHS student responded inappropriately. 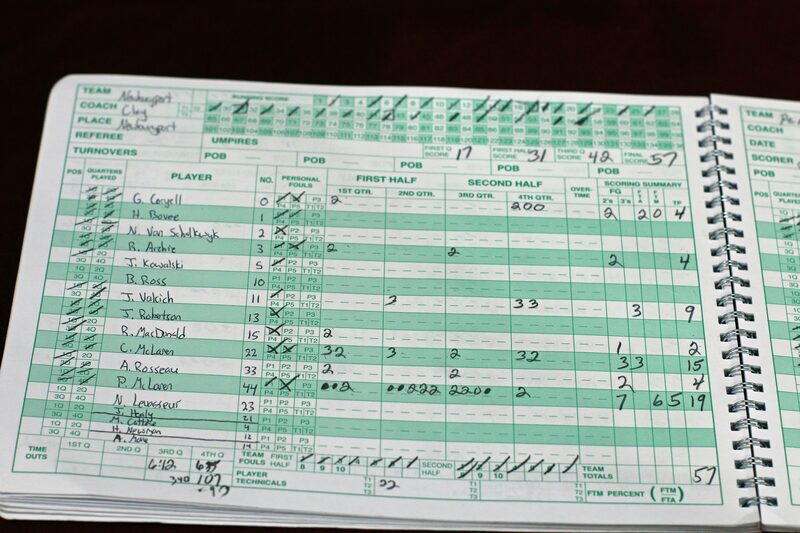 Next thing I saw was the student leaving with AD Kyle Hodsdon. 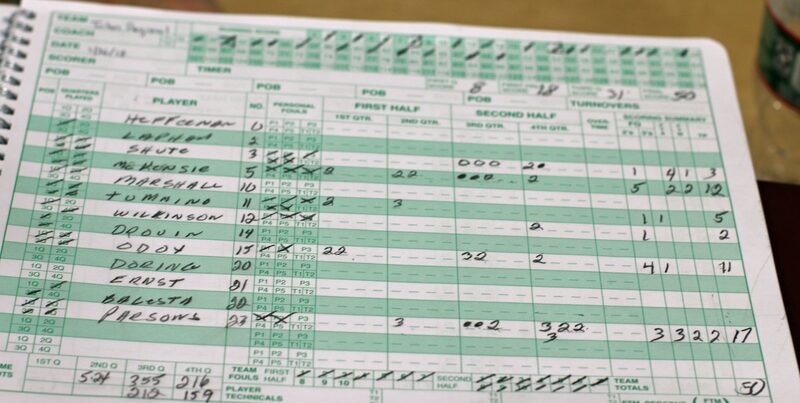 The AD returned but the student didn’t. 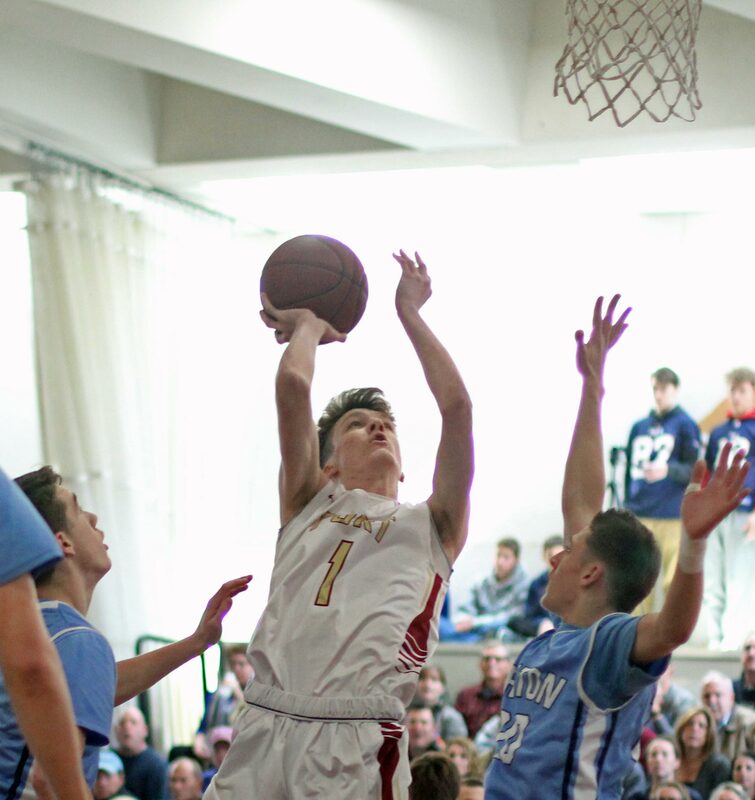 End of problem. 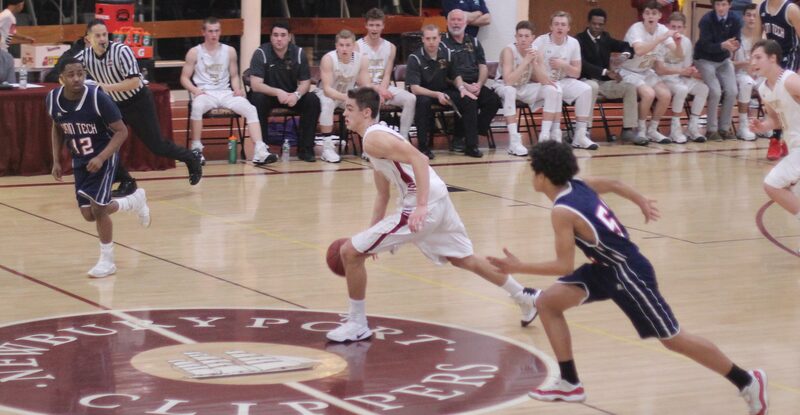 Newburyport was 19-3 last year. 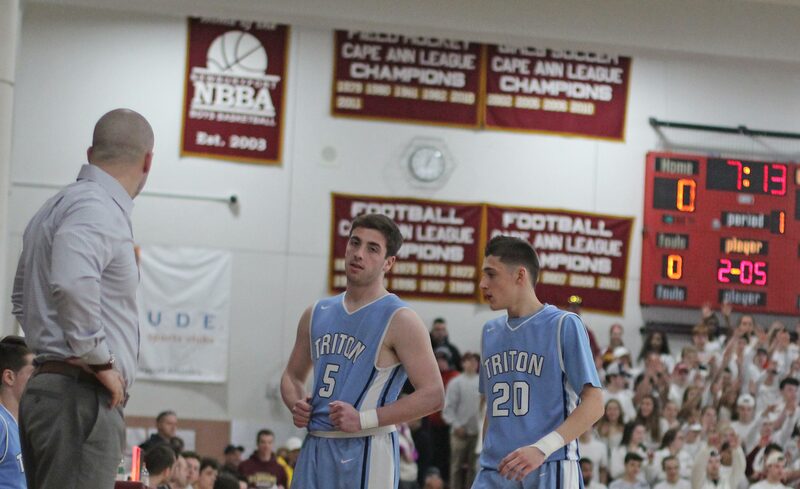 Triton was 15-8. 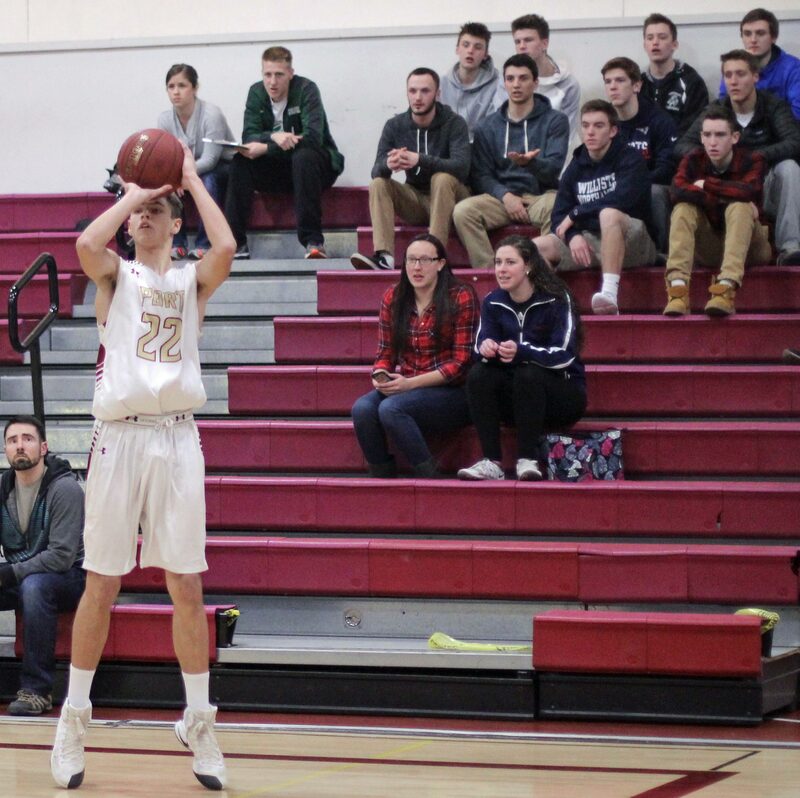 Ryan Archies’ three 3’s gives him twenty-five 3-pointers for the season. 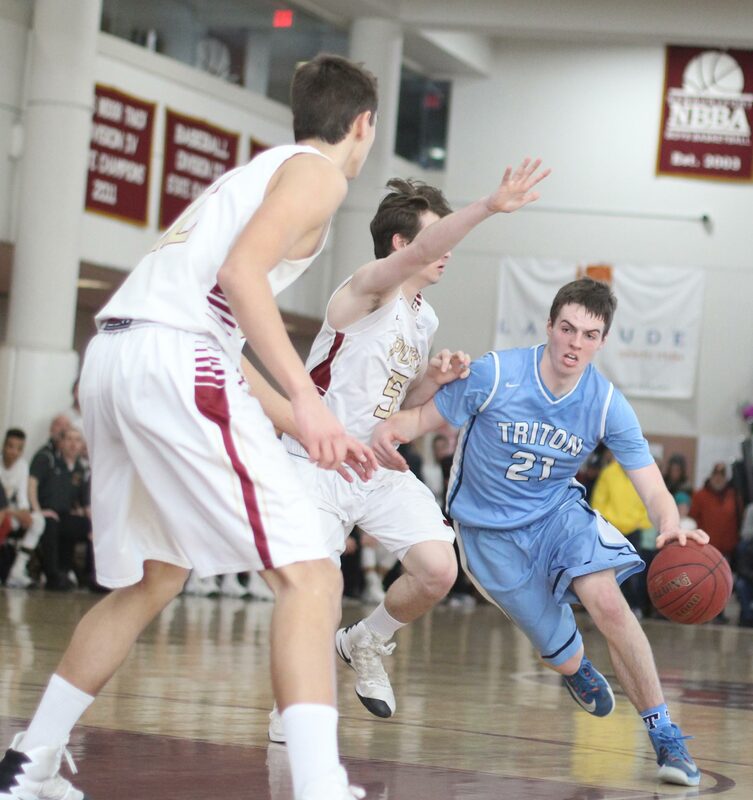 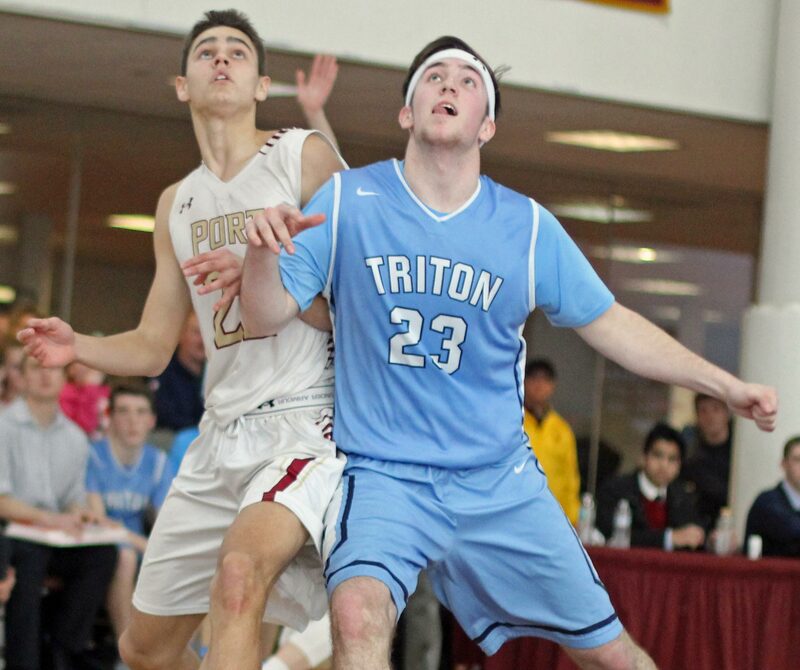 Casey McLaren had twenty-four points in the first meeting with Triton. 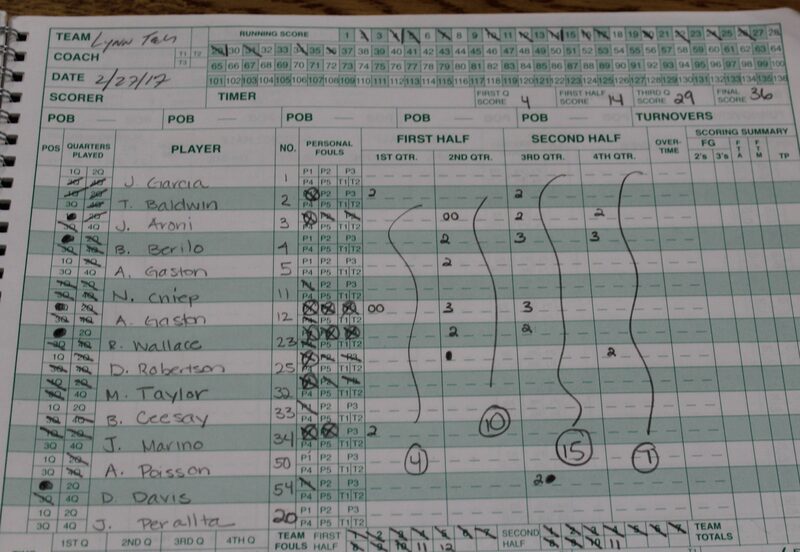 Freshman Kyle Odoy had twenty for Triton. 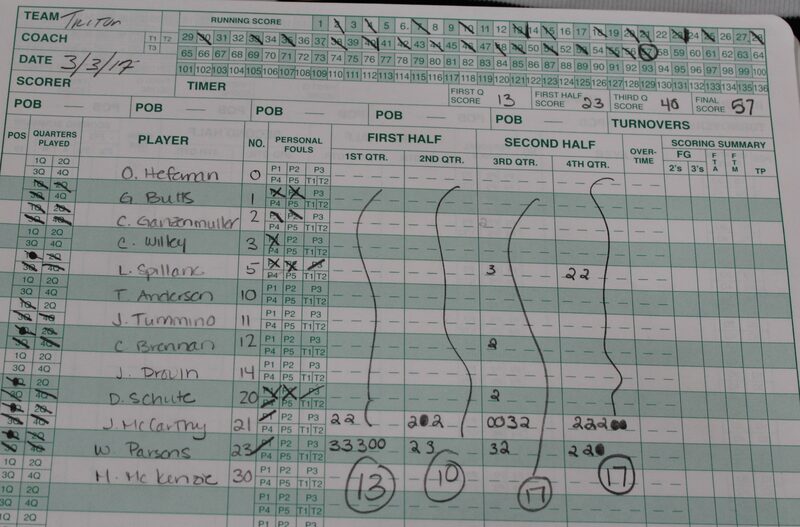 Casey McLaren (18 points) had good looks most of the night. 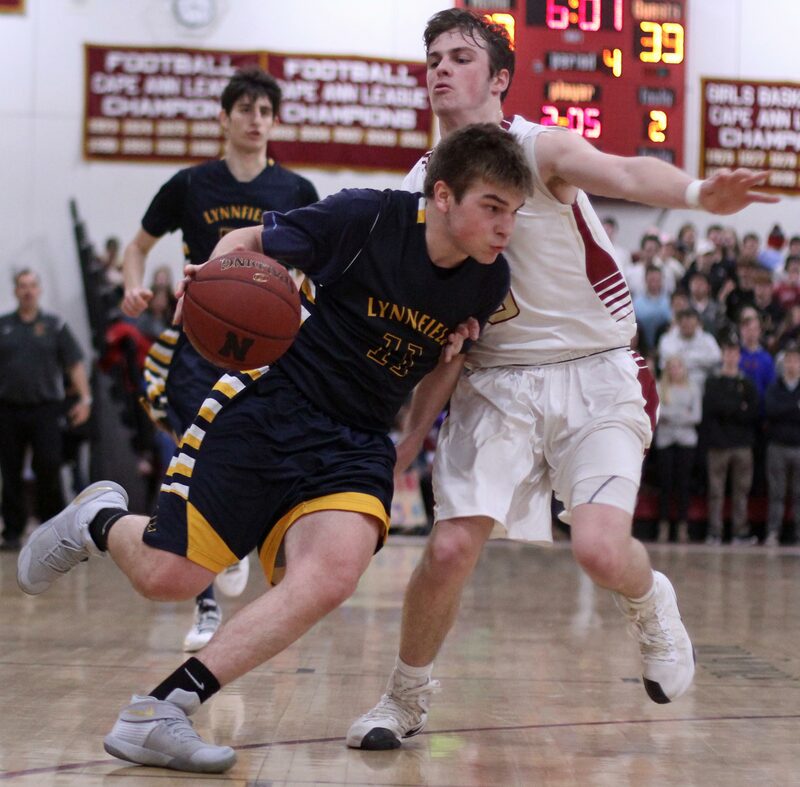 (Newburyport MA) Disappointing performance by Lynn Tech. 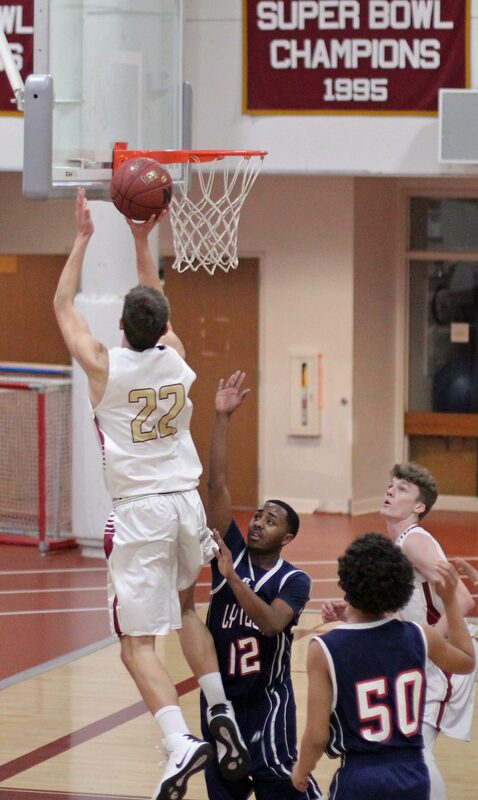 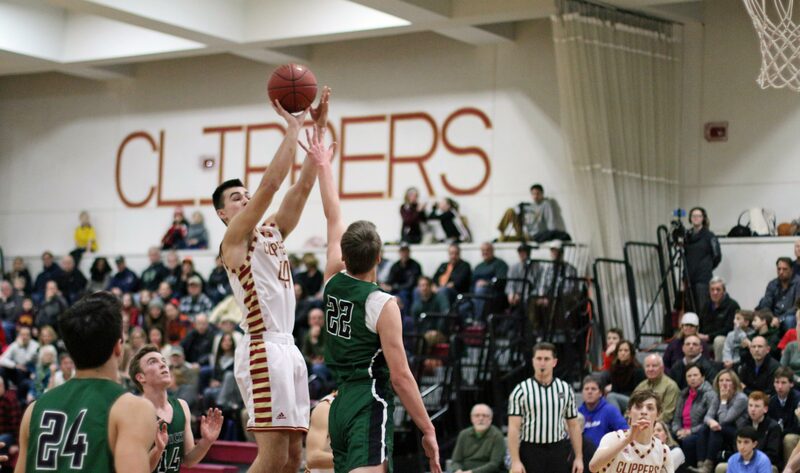 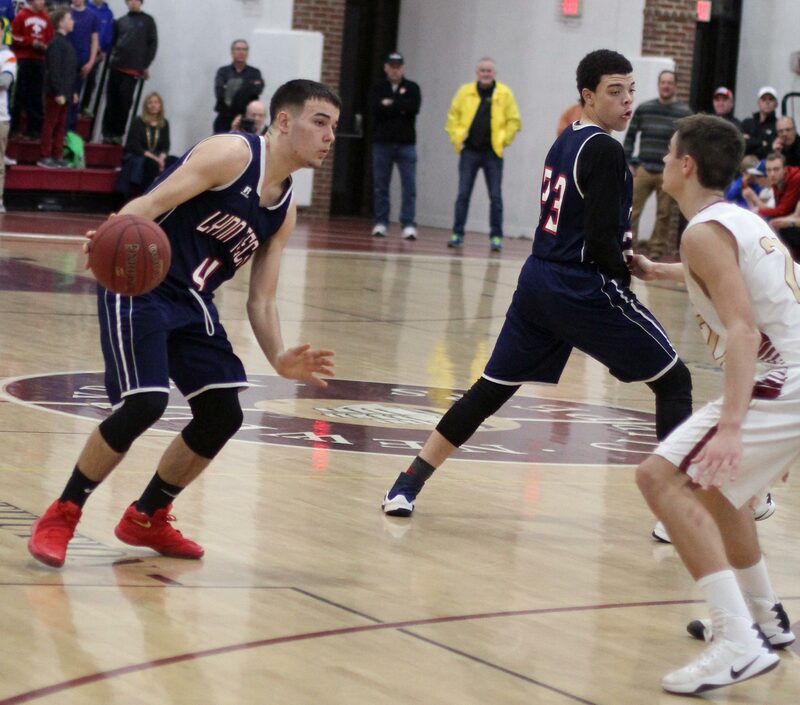 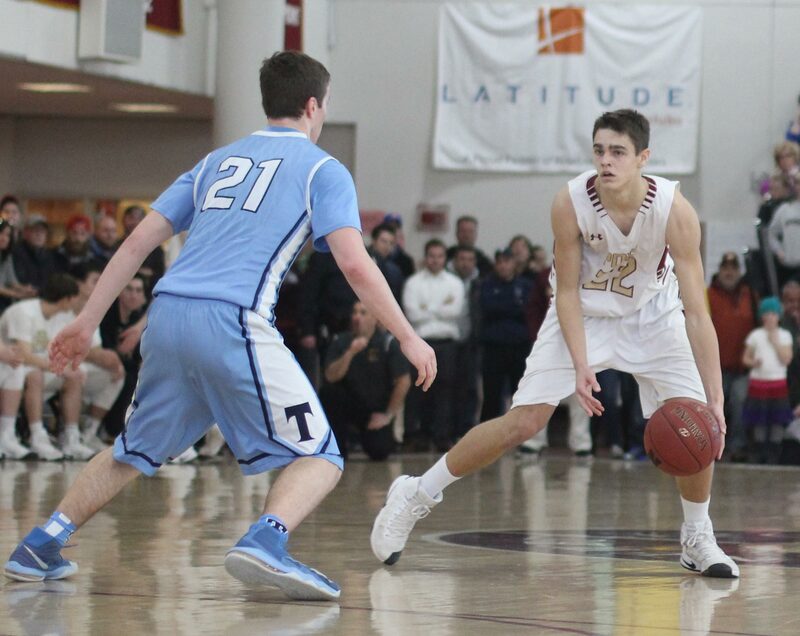 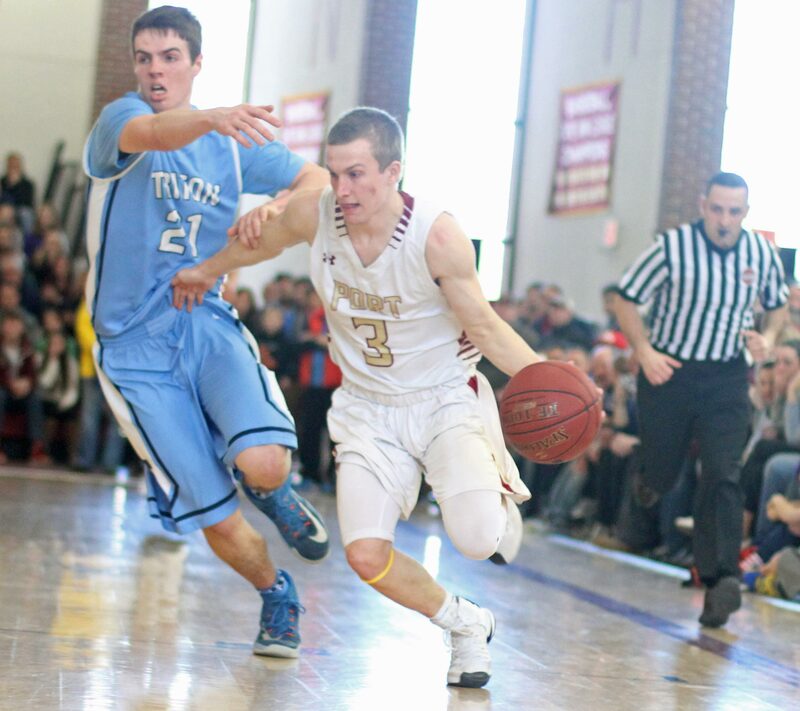 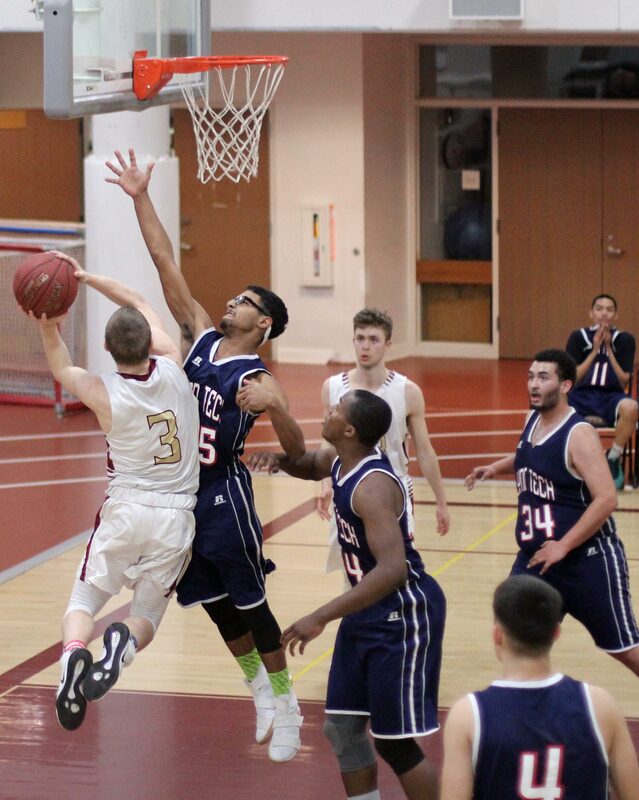 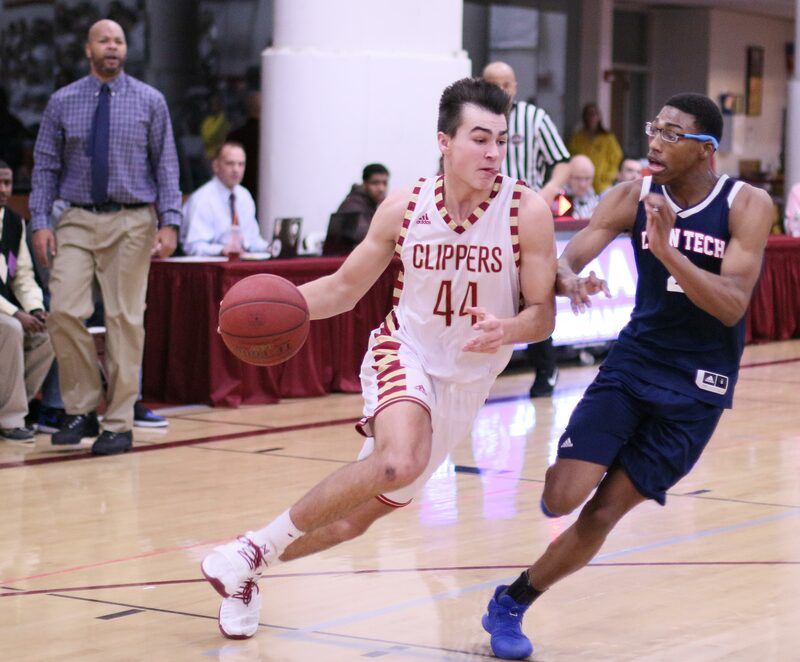 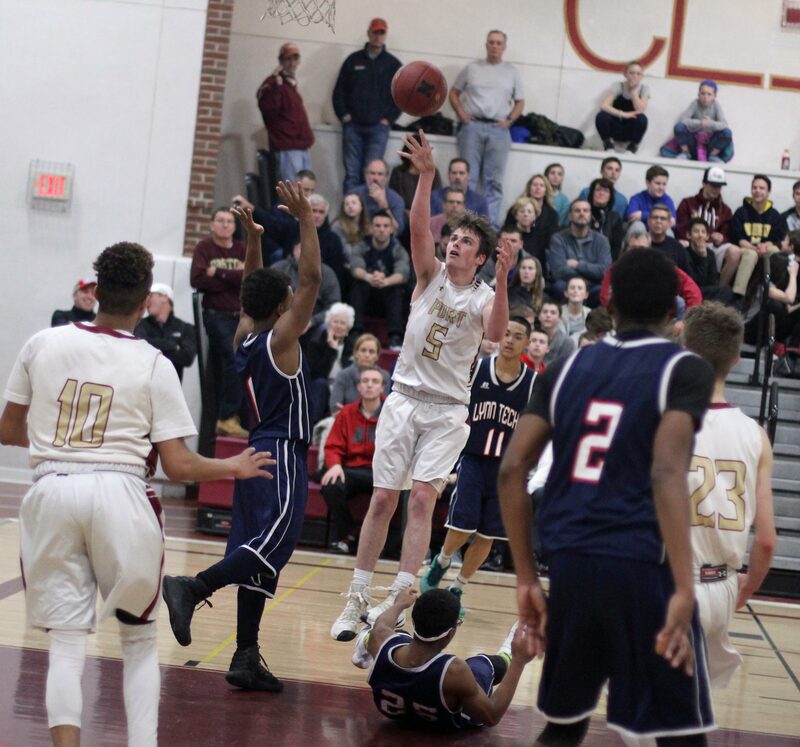 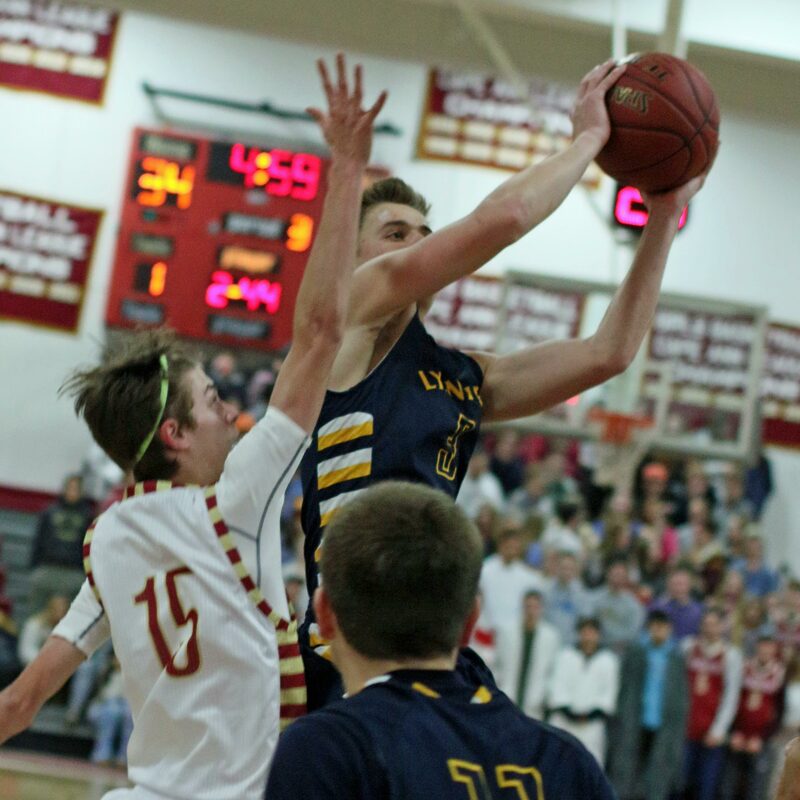 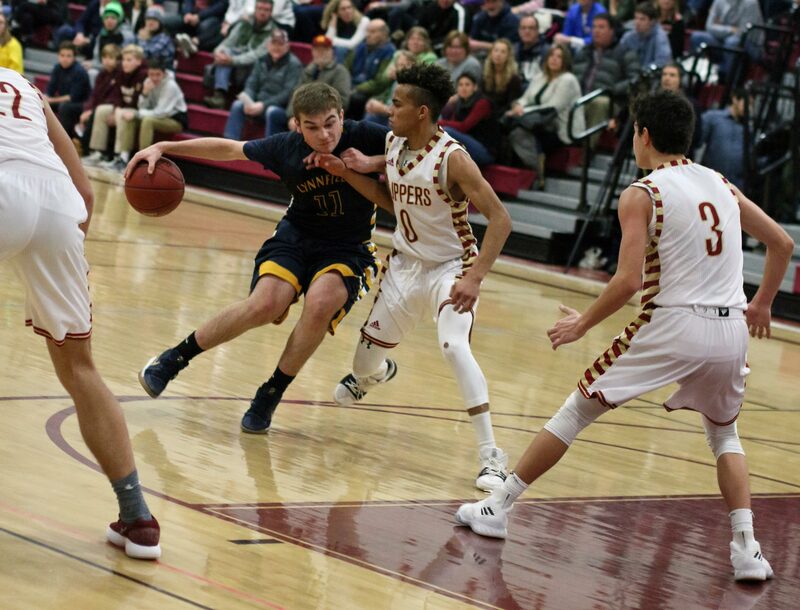 #2 Newburyport trounced #15 LT, 70-36, on Monday night in First Round action in the Division 3 North tournament. 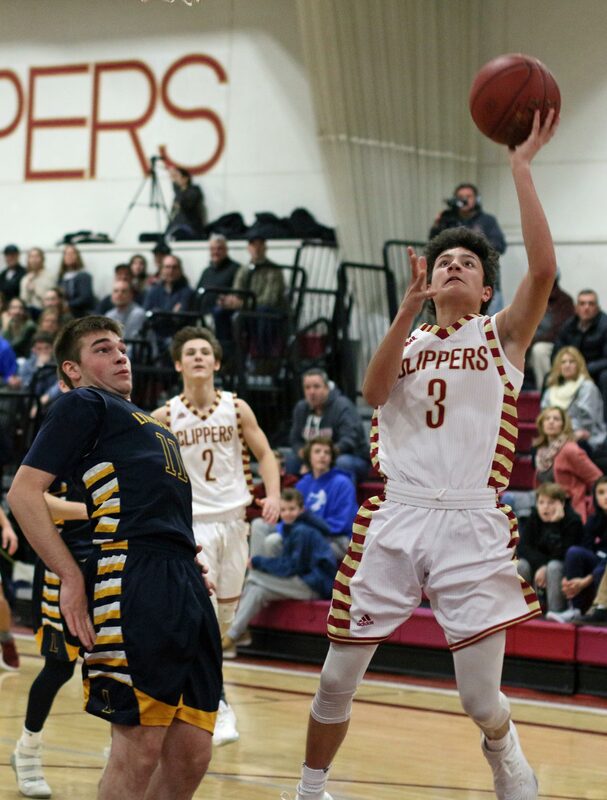 The Clippers (18-3) scored the first eleven points of the game before the Tigers (7-14) finally made a basket (John Marino) six minutes into the first quarter. 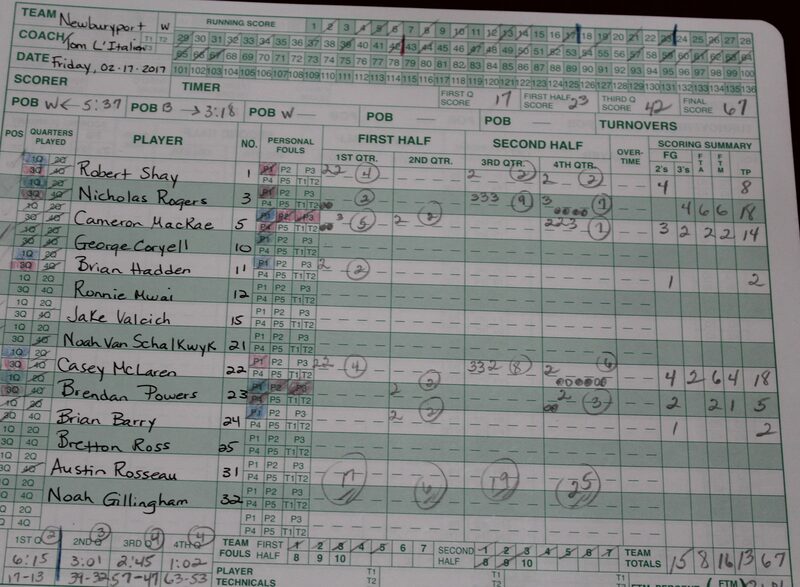 The second quarter followed suit. 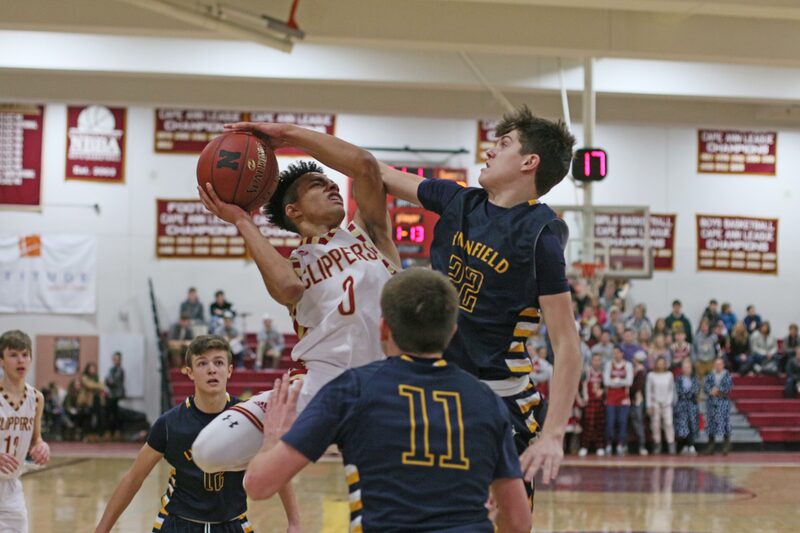 Newburyport started it with a 14-1 run as the game reached the embarrassing level (30-5) with 3:40 to go until halftime. 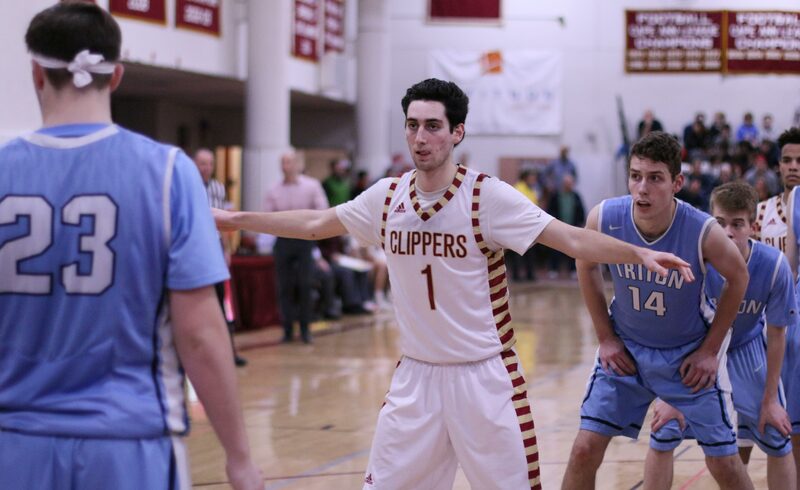 The Clippers were very impressive all over the court. 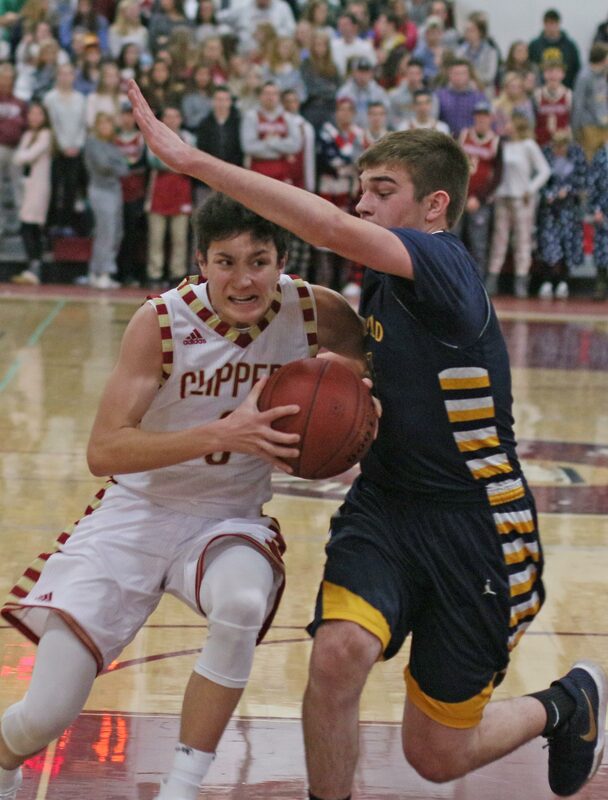 The Tigers (winners of four straight coming in) tried to zone the Clippers but instead of shutting down the inside there were opening galore to the basket. 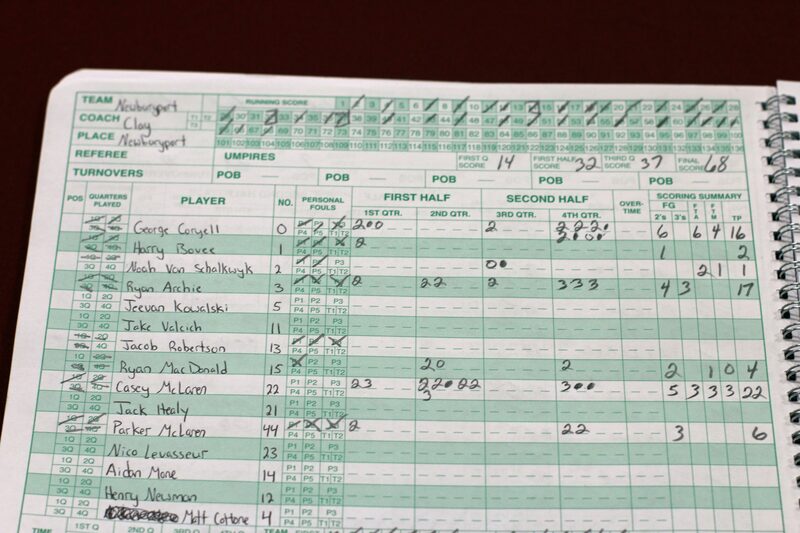 Newburyport made sixteen layups in the game. 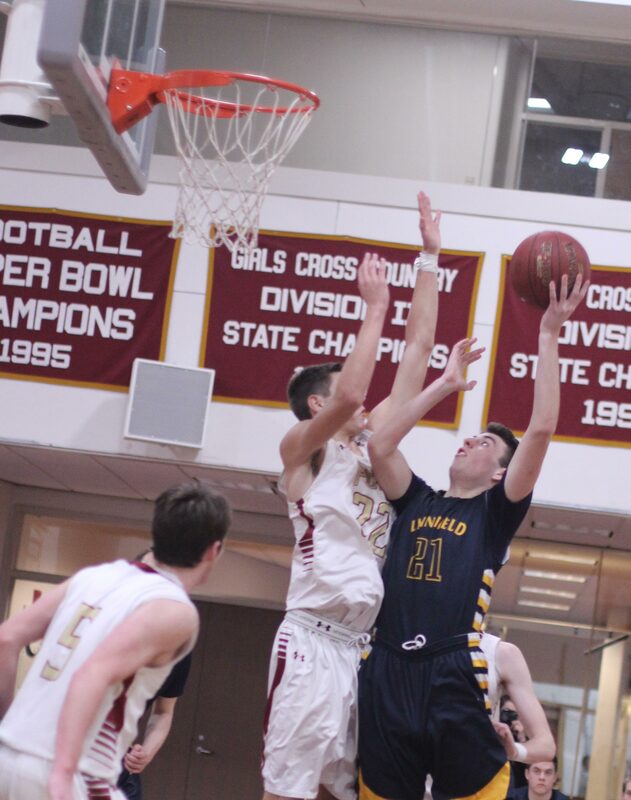 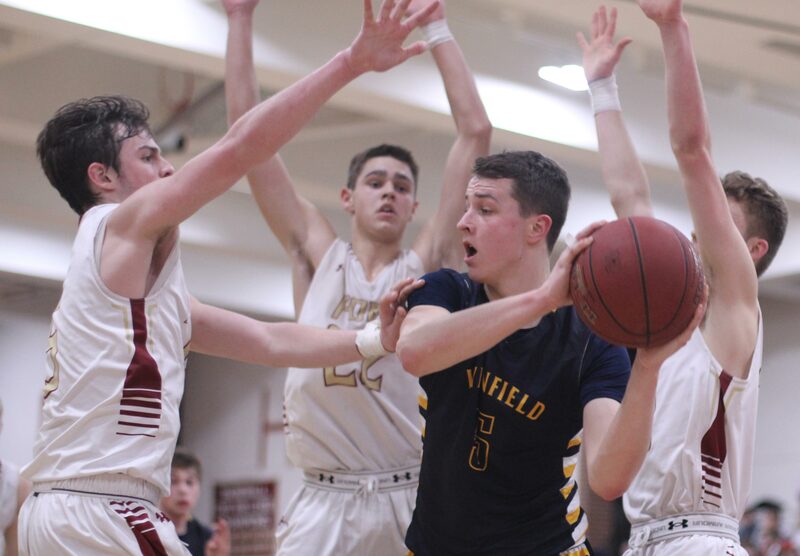 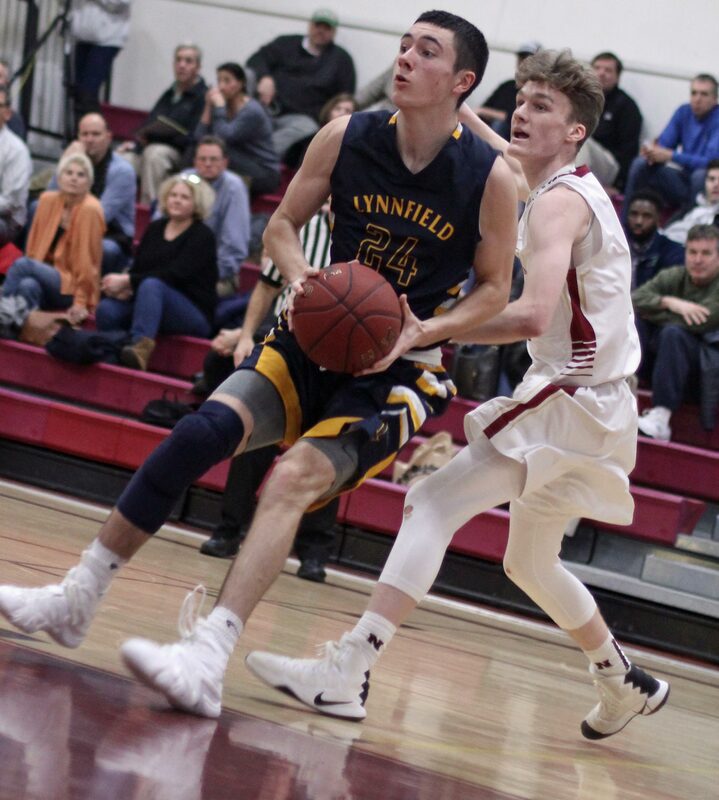 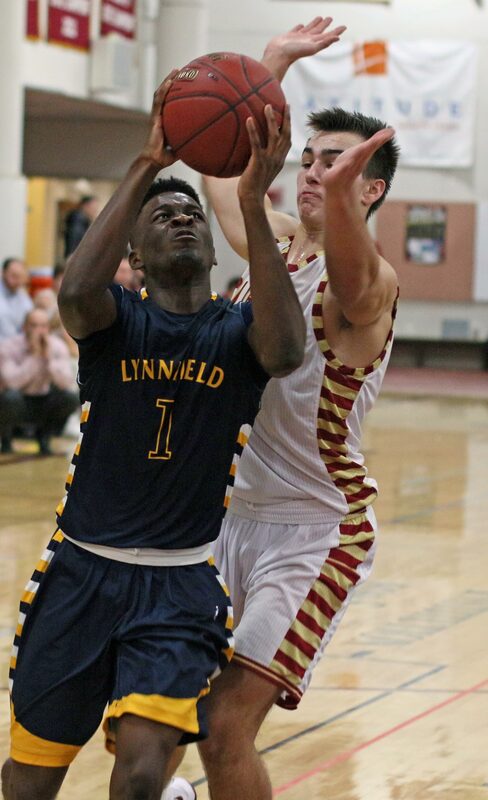 I saw the Newburyport game against Lynnfield and Casey McLaren struggled early but ended up with double figures. 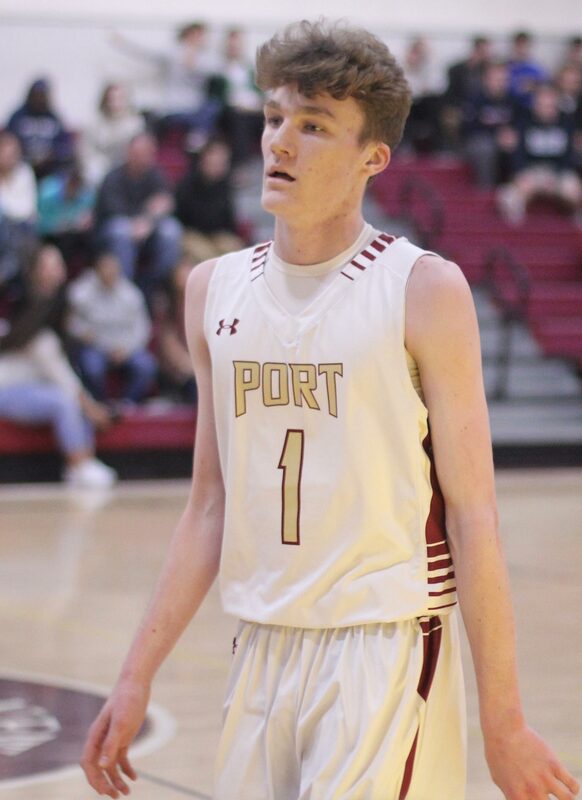 No struggles early this time for the talented sophomore. 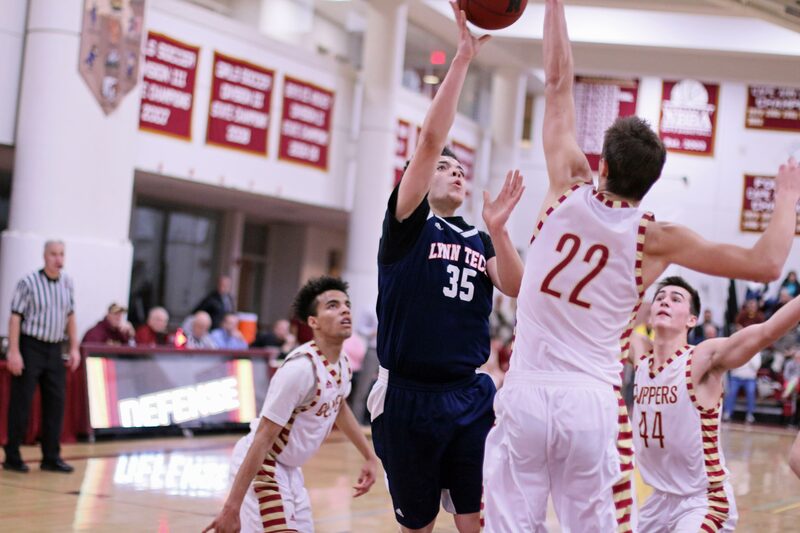 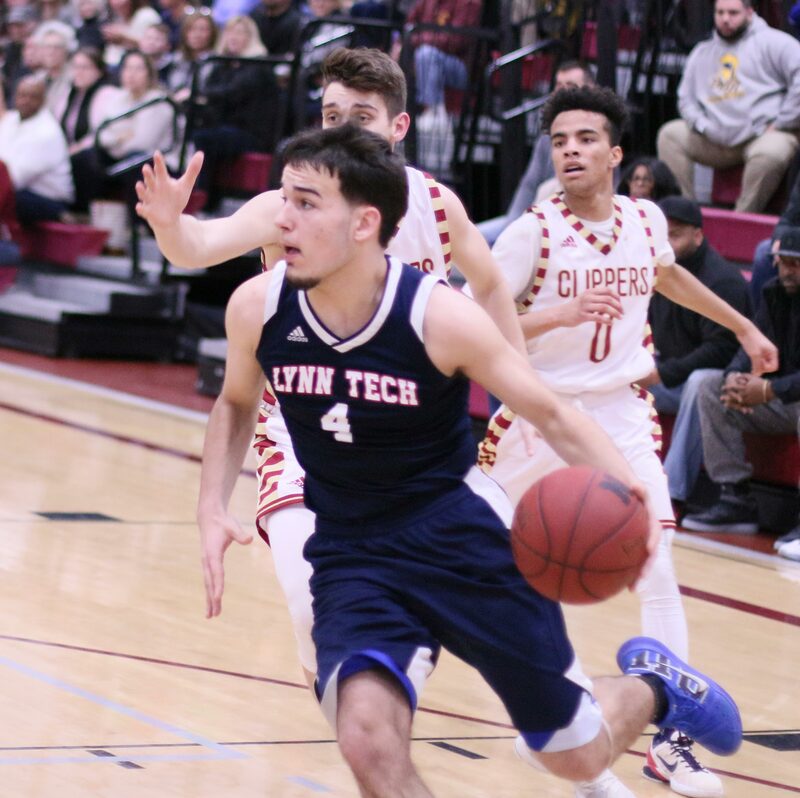 Shots from all levels seemed available and, versus Lynn Tech, Casey led all scorers with eighteen points. 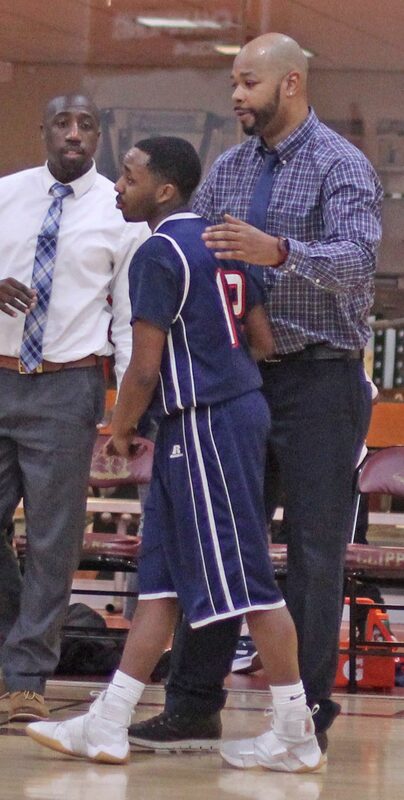 LT coach Stevie Patrick had Marcus Taylor denying the ball to Casey in the second half but by then the game was well out of hand. 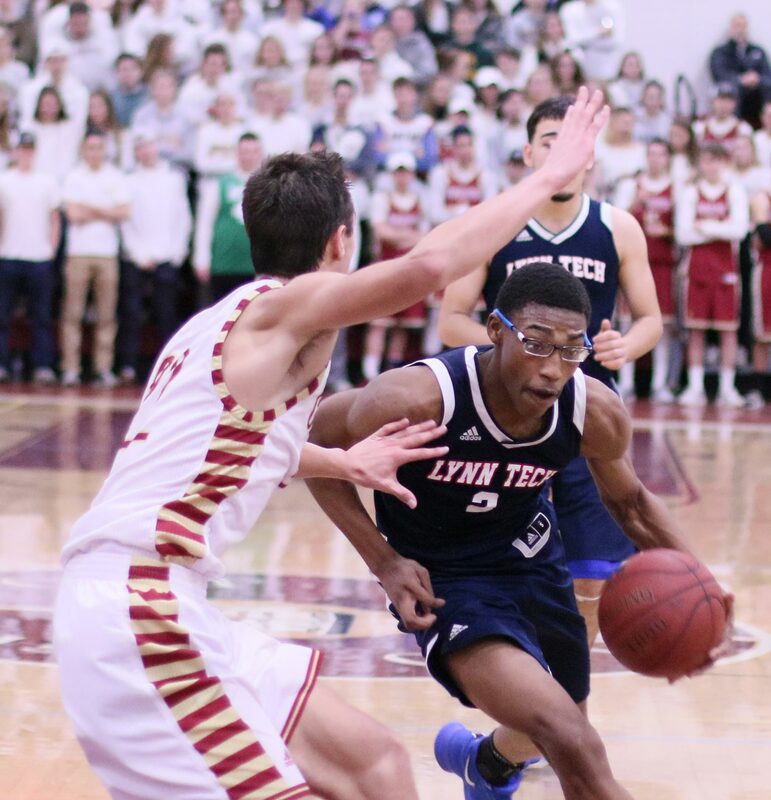 In Lynn Tech’s disastrous first quarter the Newburyport man-to-man defense forced seven turnovers. 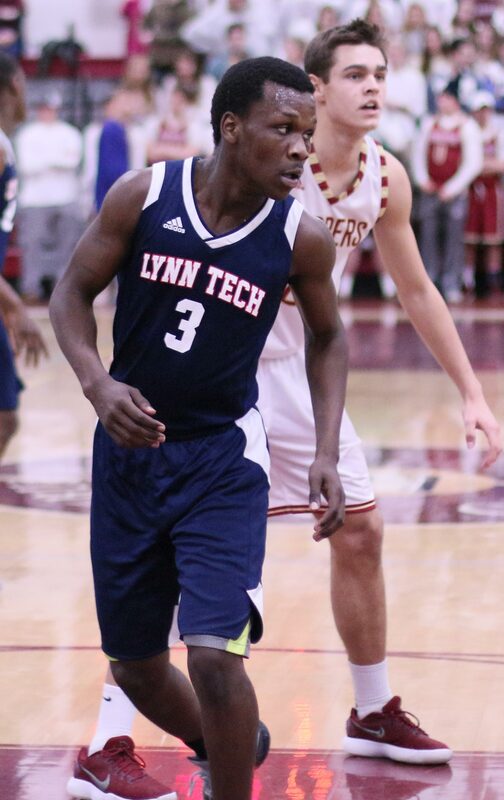 The Clippers usually take and make many three’s during a game but versus Lynn Tech the inside chances ruled the day. 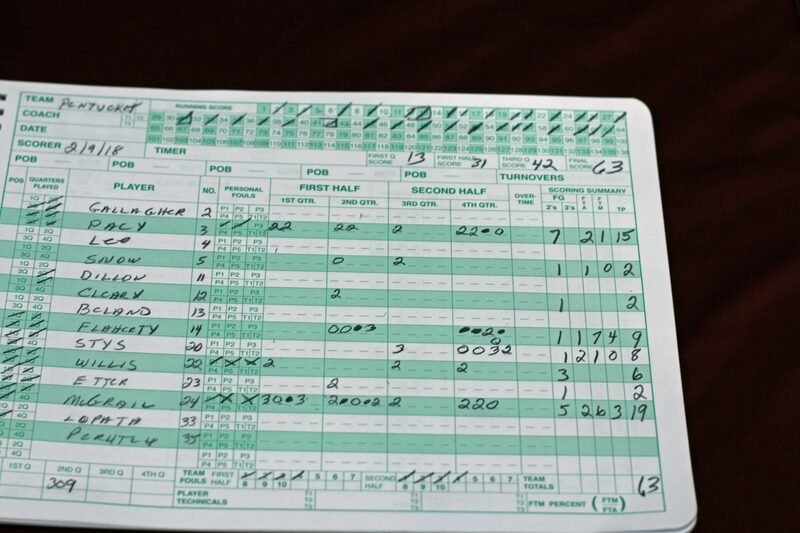 The Tigers had as many 3’s (four) as the Clippers did. 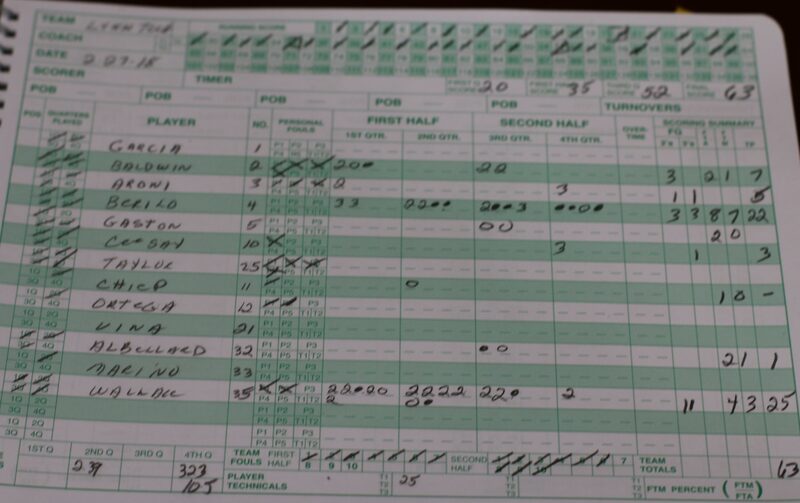 LT had three brutal scoring droughts. 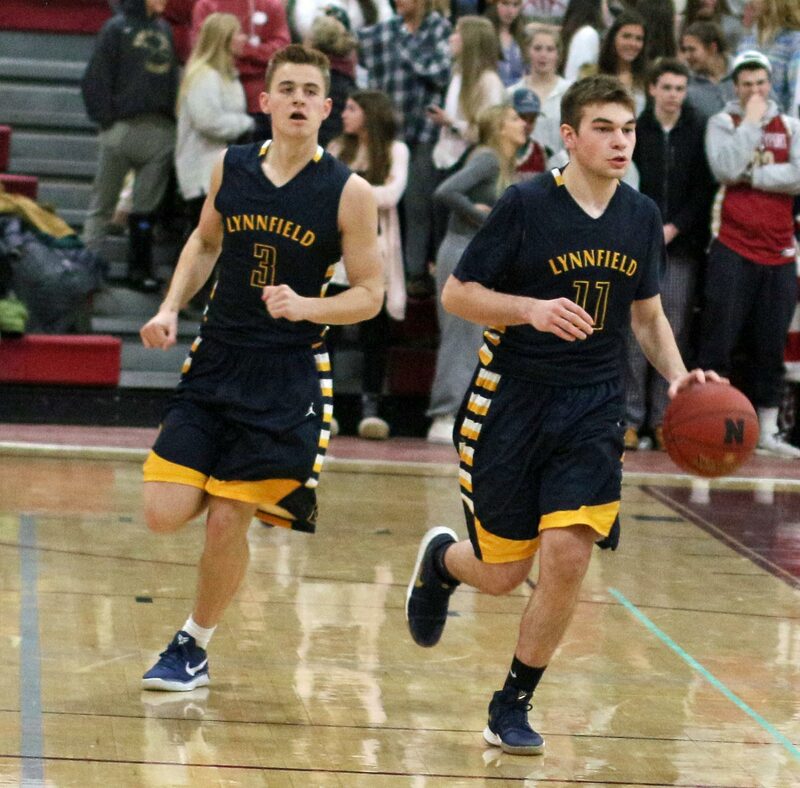 I have already referenced two of them. 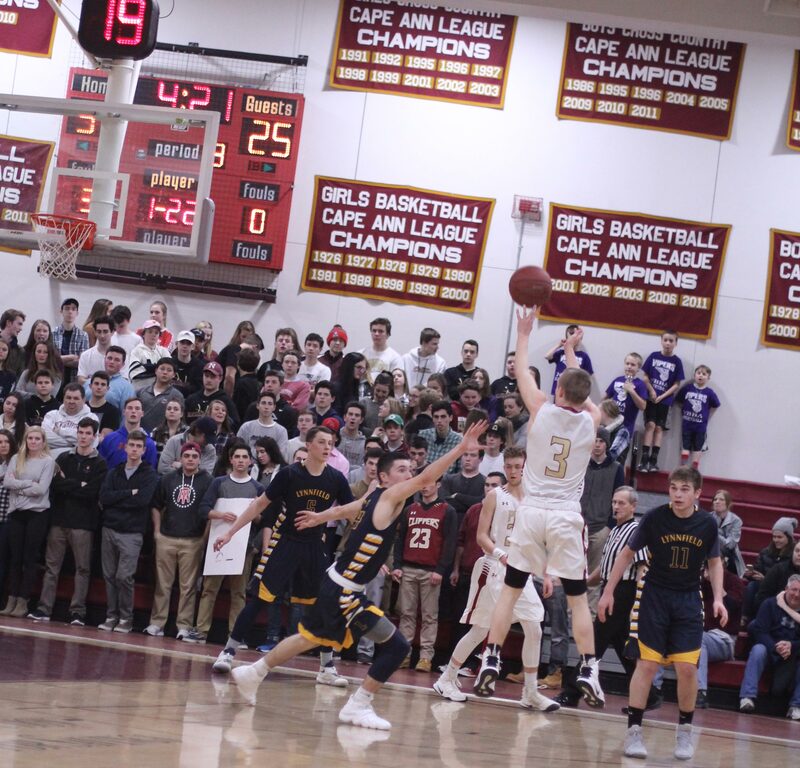 Here’s the third: in the final 6 ½ minutes of the game, Lynn Tech was held scoreless while Newburyport collected thirteen points. 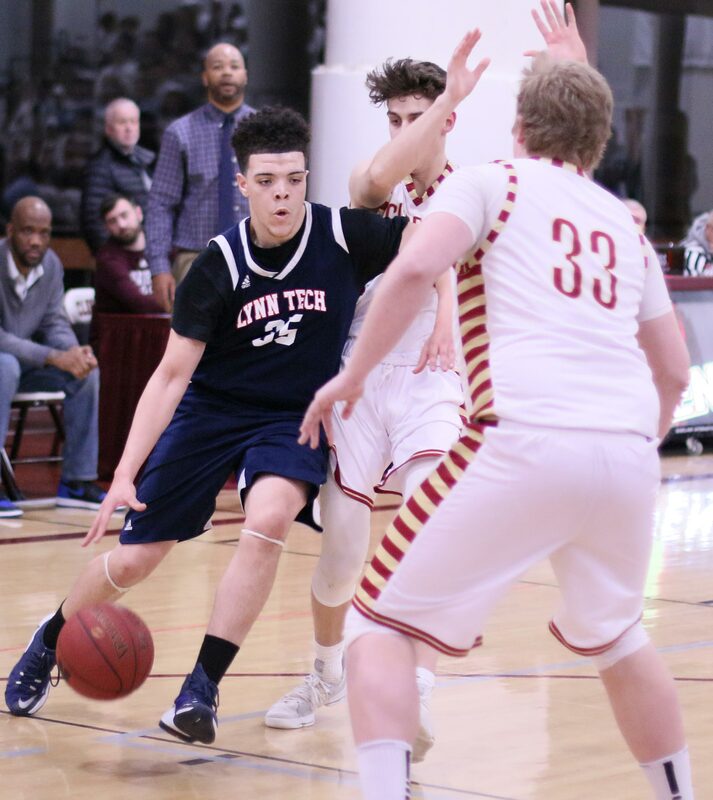 Put those three droughts together and during sections of this game Lynn Tech was outscored, 38 to 1! 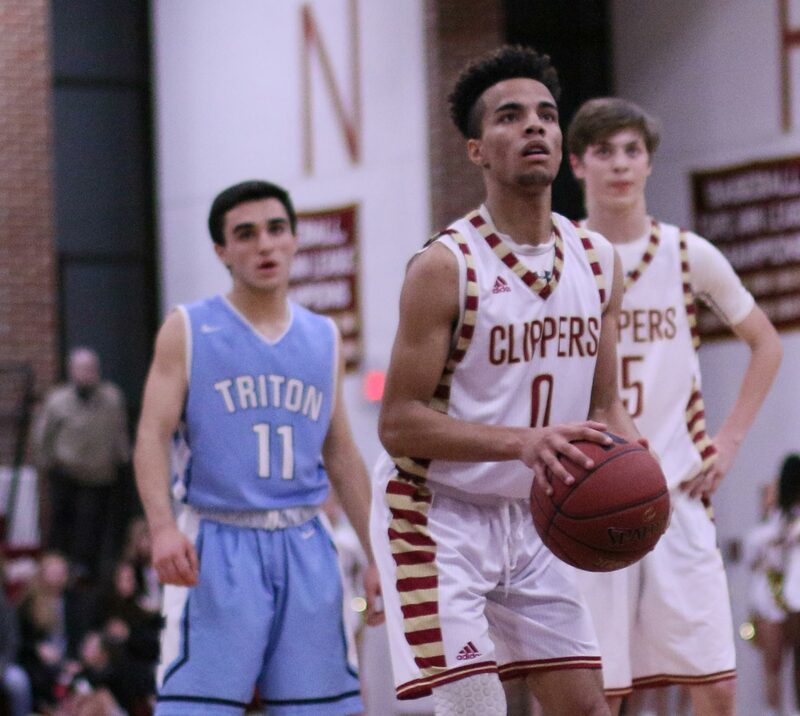 Belmin Berilo paced the Tigers with eight points. 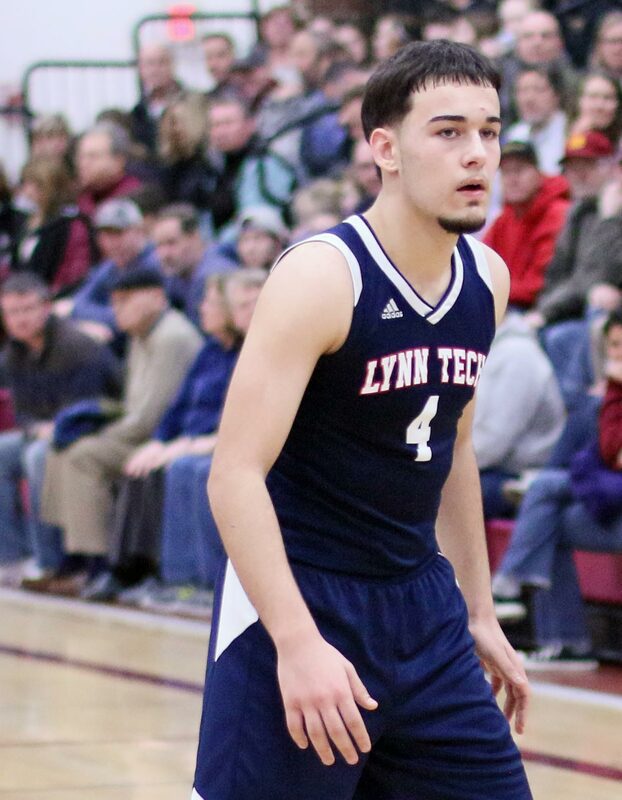 Lynn Tech won the Commonwealth Athletic Conference Small division. 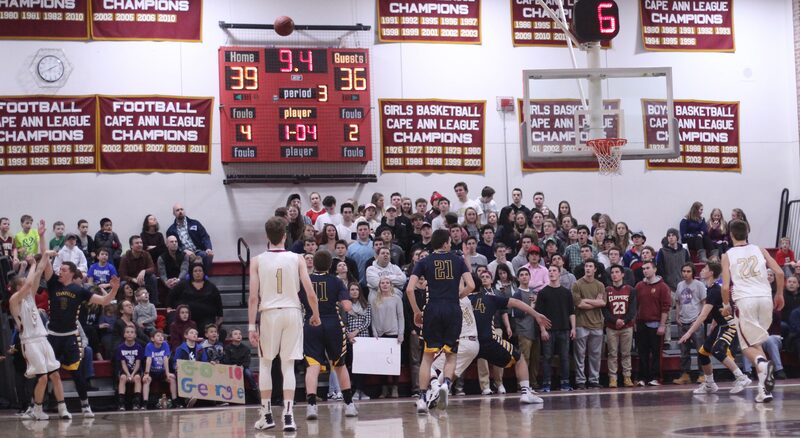 Good crowd of Newburyport enthusiasts in the house. 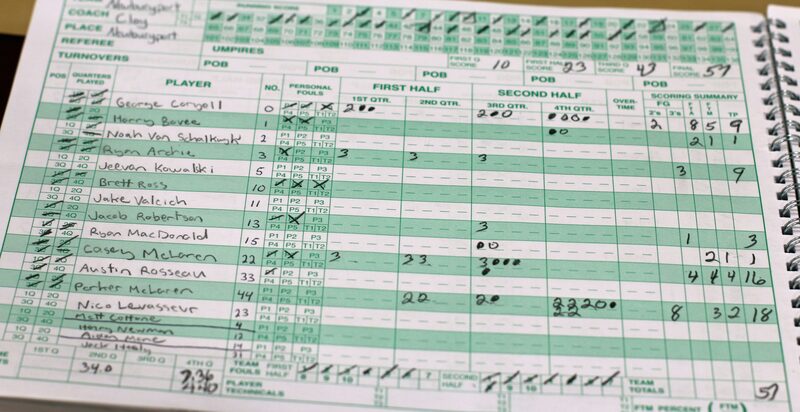 Forget just being the sixth-man. 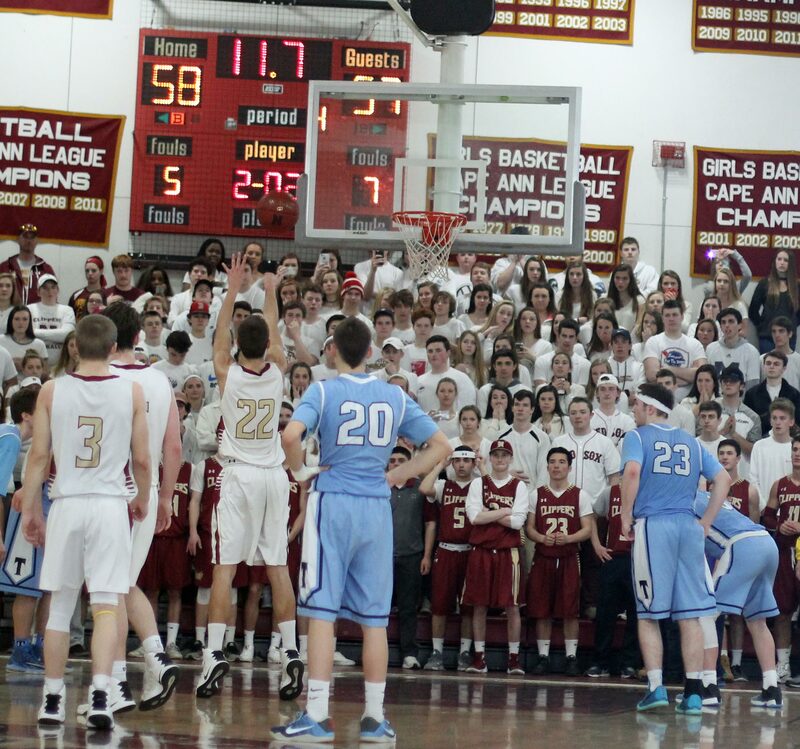 Before the game, they turned into some type of choral group as they performed the National Anthem.